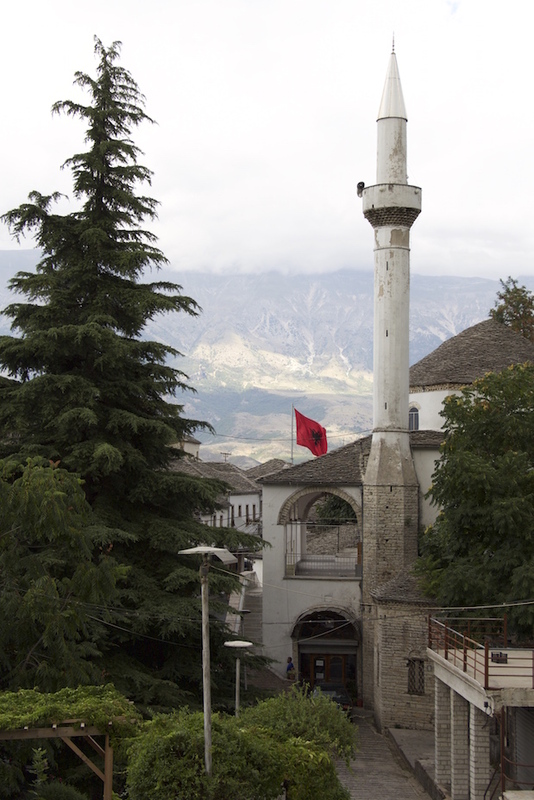 The only remaining minaret of Gjirokastër (out of 14) which was not destroyed during the culture revolution. 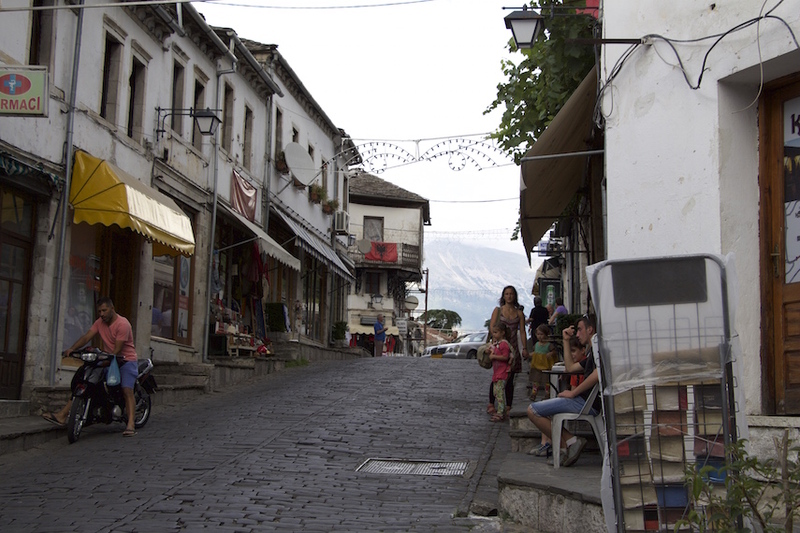 The "modern" part of the town - not really beautiful! Our guide, a 17-year-old student ... with an impressive knowledge on the history of the town of his birth. 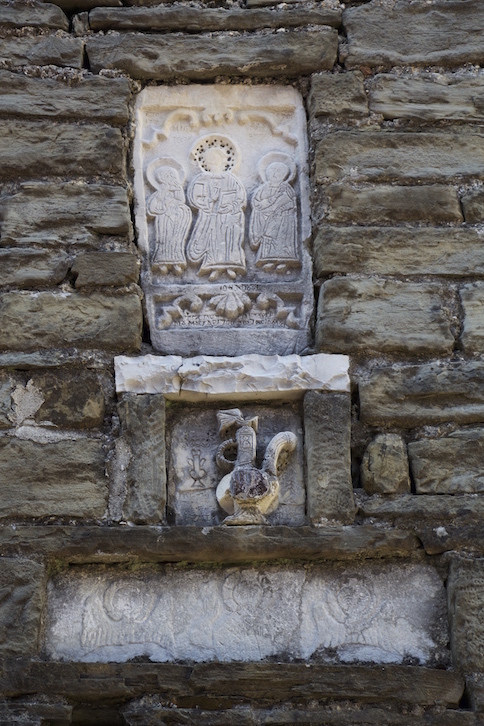 Old relief on the wall of the only remaining (Orthodox) church. 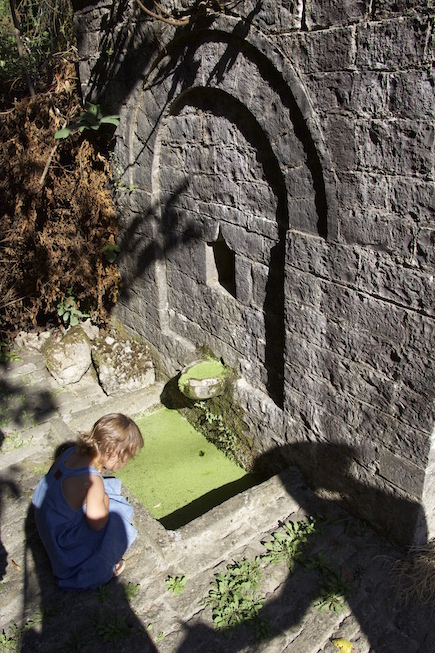 ... the round thing in the background is the top of a cistern. 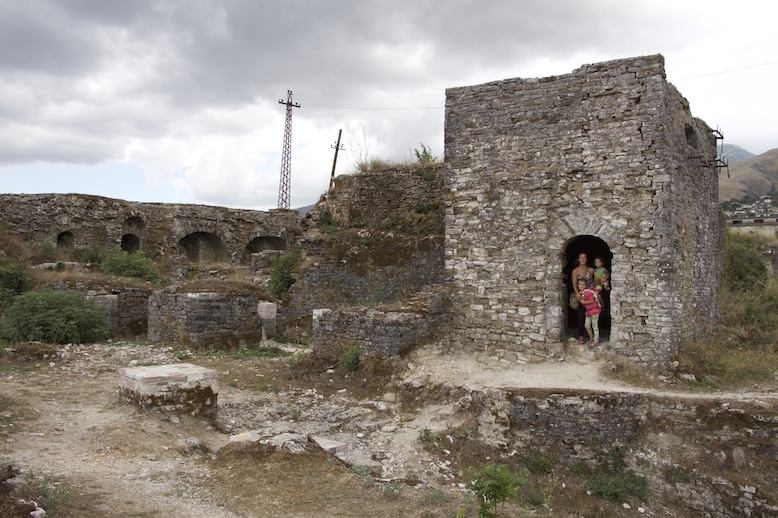 The city of Gjirokastër looks back on a 2000 year old history from Greek to modern times. 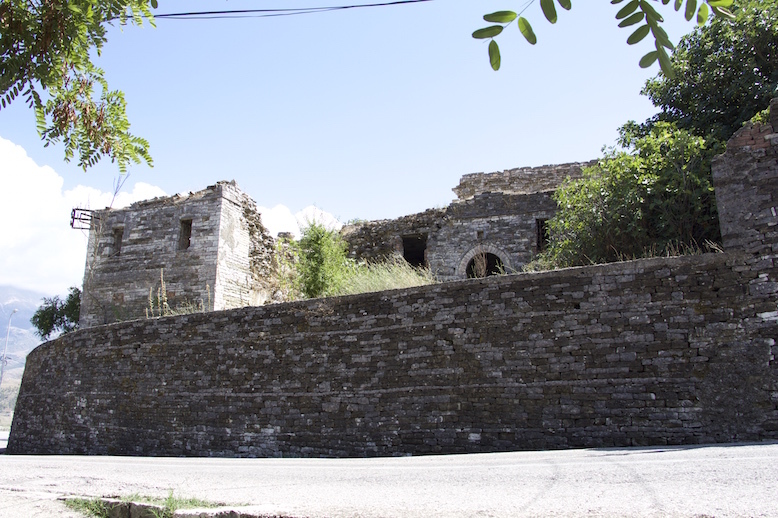 The name goes back to Greek Argyrokastro, "silver castle" and may be associated with the silvery stone tiles which are used here to cover the roofs. 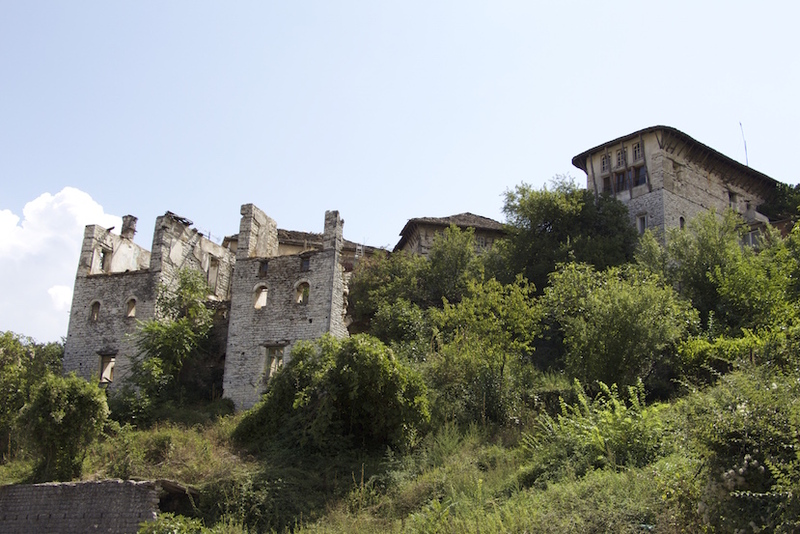 The impressive castle looking down on Gjirokastër - detail. 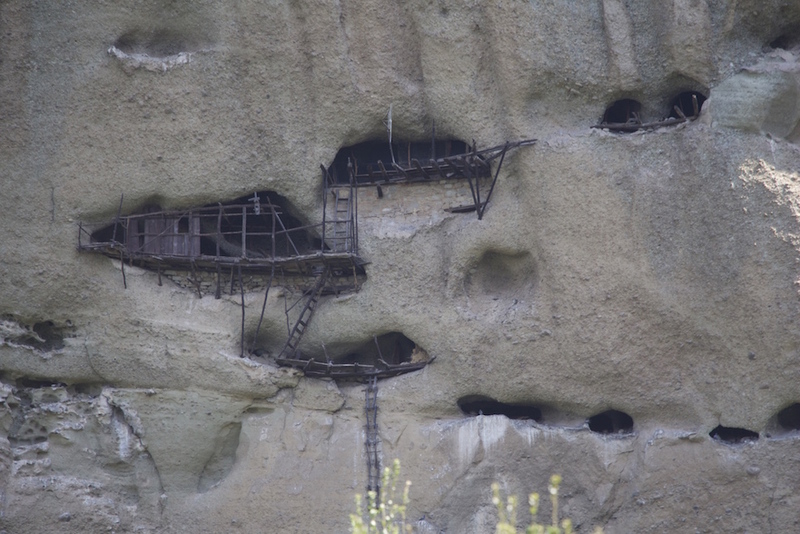 Castle - still in ruins and not secure to walk on. 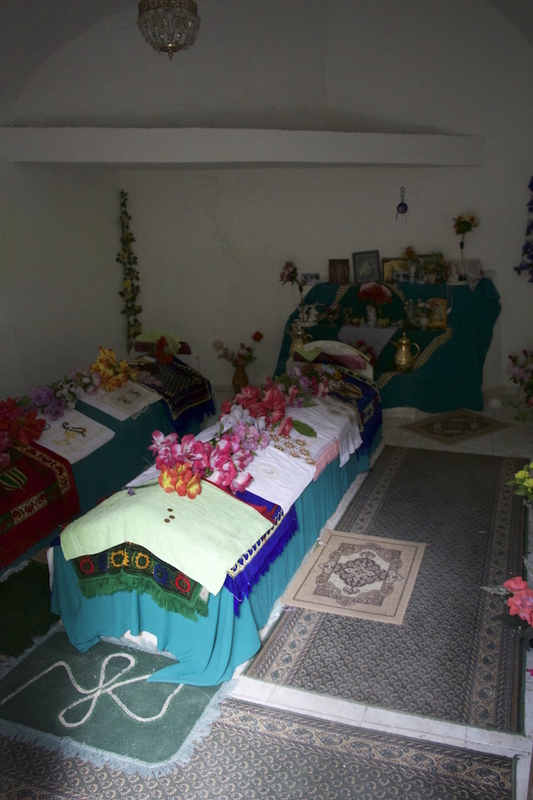 Tomb of a member of the Bektashi order (inside the castle). 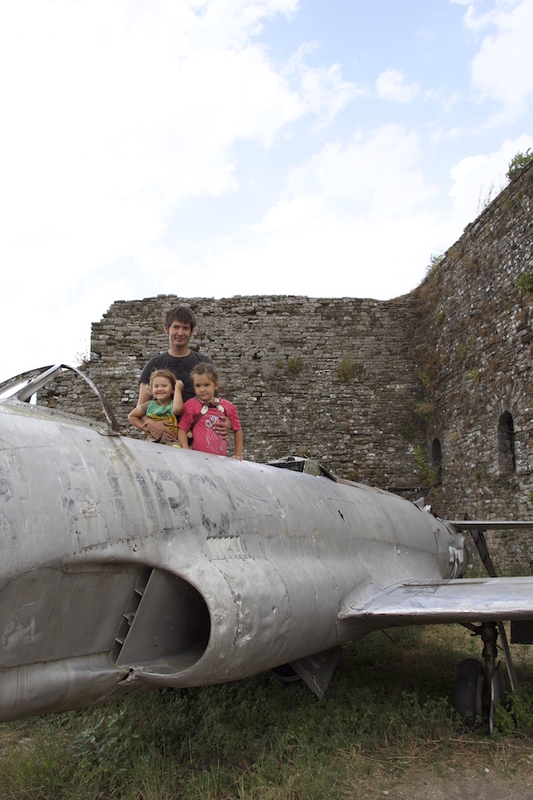 Spy pilots of the cold war - old American plane within the castle walls. 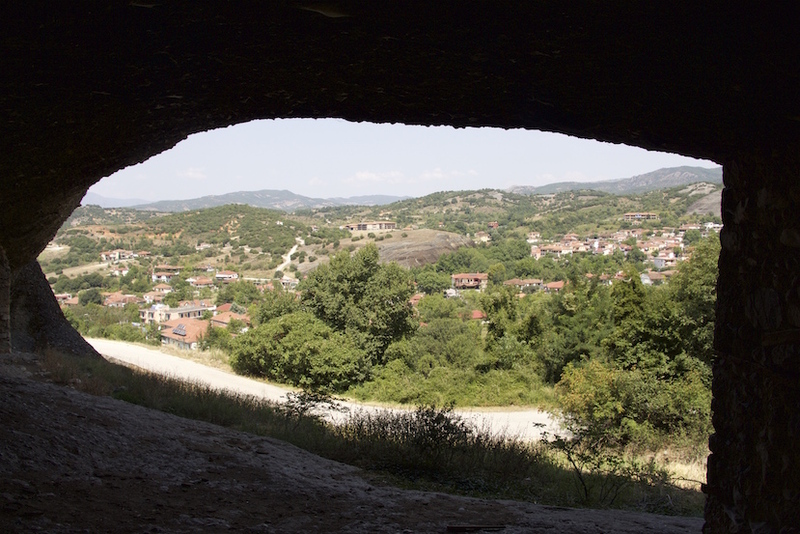 For a long period, the city was an important Turkish administrative centre and still is one of the most important fortified cities on the Balkans. 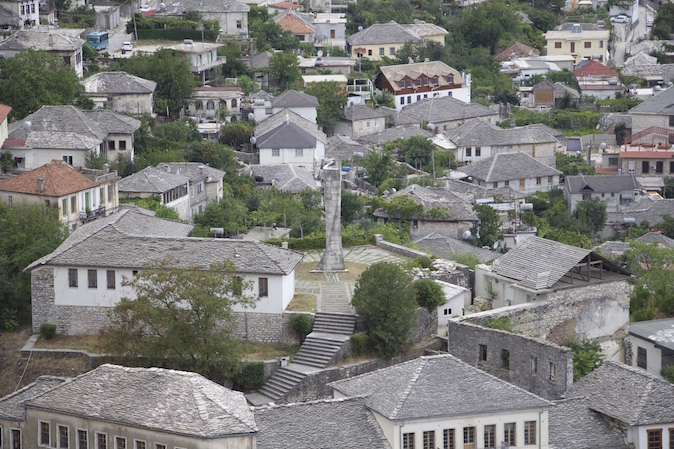 At the end of the 19th century this city was taking the lead of the Albanian resistance movement. 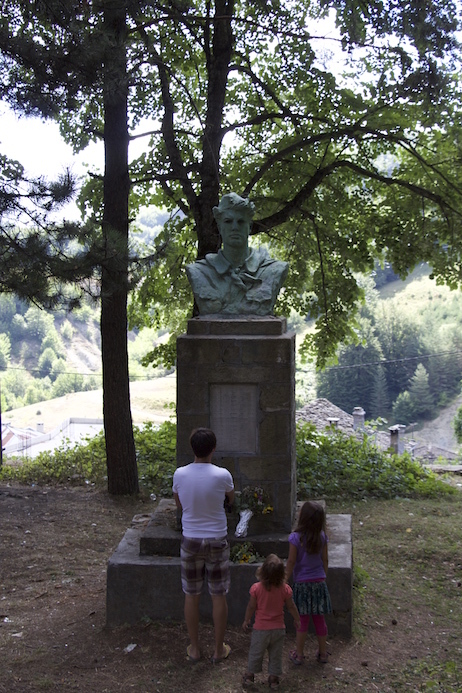 Our little partisan in front of the memorial for the partisans from this quarter. 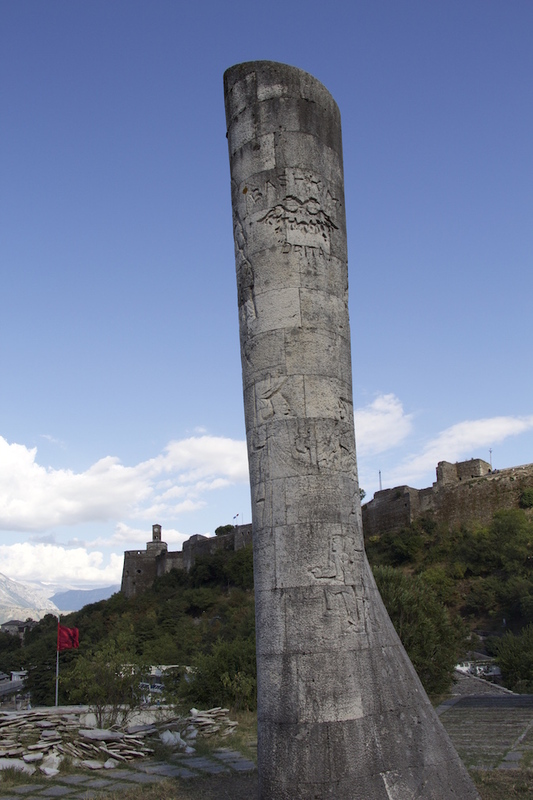 Memorial for the courageous teachers who - facing the death sentence if they were discovered - taught their students in Albanian before 1908. 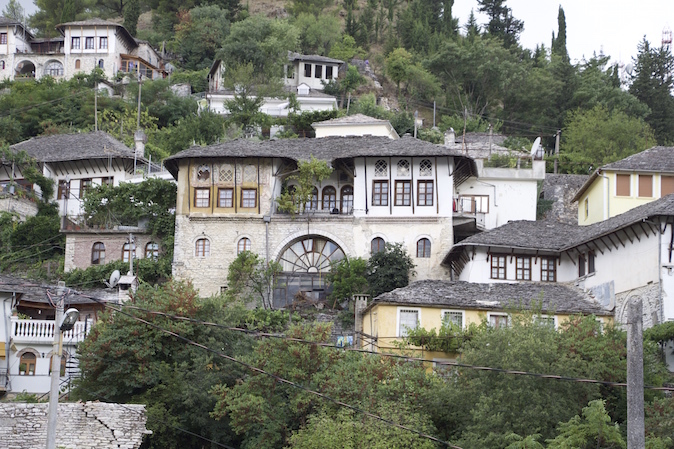 Ironically, the city was preserved to a great deal because the dictator Enver Hoxha was born here and declared the town of his birth a museum city in 1961 (which still did not stop him destroying 13 of the remaining 14 mosques during the cultural revolution in 1967). 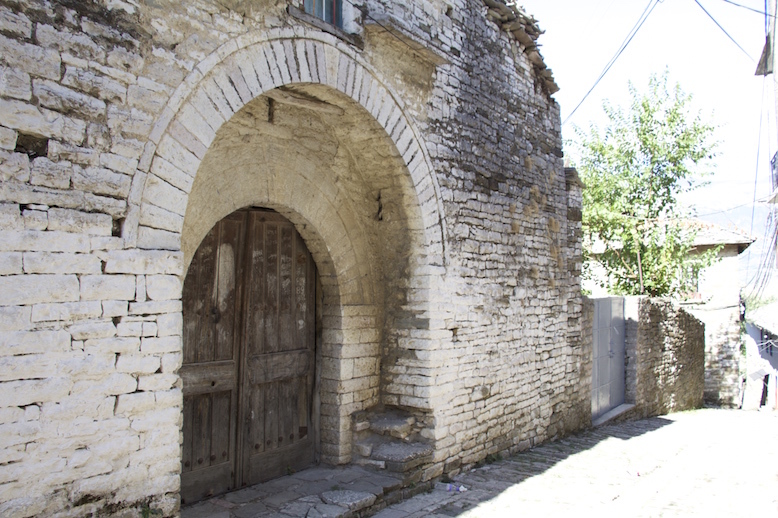 The remains of one of the old mosques - on the right you see the rest of the minaret. 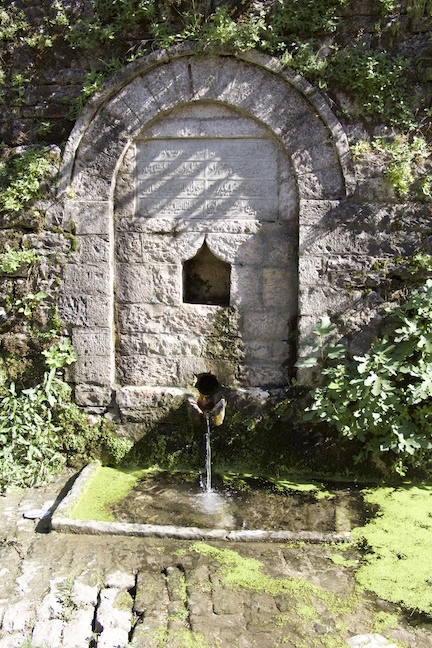 One of the seven wells where people used to wash themselves before prayer. Another well - only five of the seven remain. 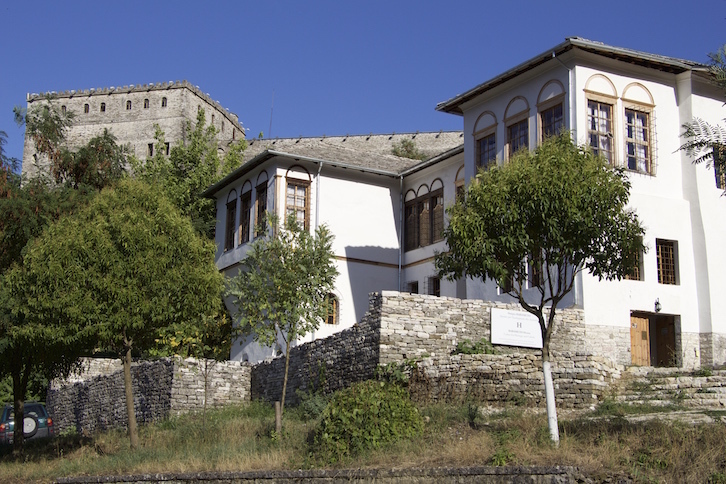 The old Hamam - now a residential house. 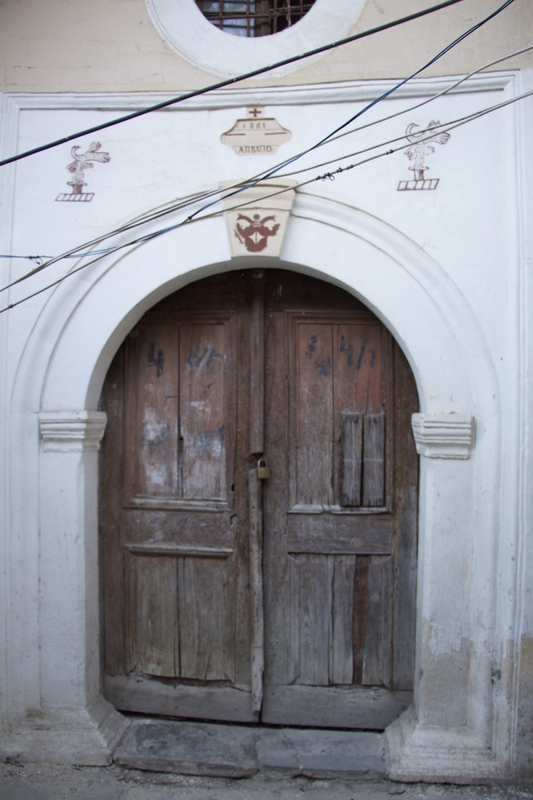 Today, many of the old buildings, especially the "Kulla" buildings, fortified residential houses, are falling into ruins because either the many owners (due to division of the estates) cannot agree on a collective decision concerning the future of their houses or simply because there is no money to restore them according to the terms of the UNESCO, as the city is a World Heritage Site. 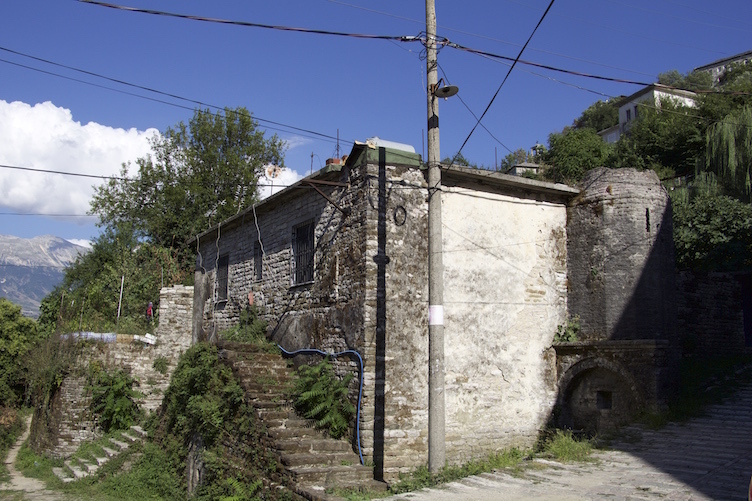 The hostel we stay in at the moment, the Babameto-House, home of the Babameto family, one of the influential families of Gjirokastër, is one of these houses, which was restored with the help of a foundation. Today, this beautiful and impressive house is used completely as a hostel and from our point of view it is one of the most beautiful and spacy hostels existing. Adults can stay here for the very reasonable price of 12€ for b&b and thereby help keeping this building in the shape it is in (please see our accomodation and camping page). The Babameto Hostel from the outside. 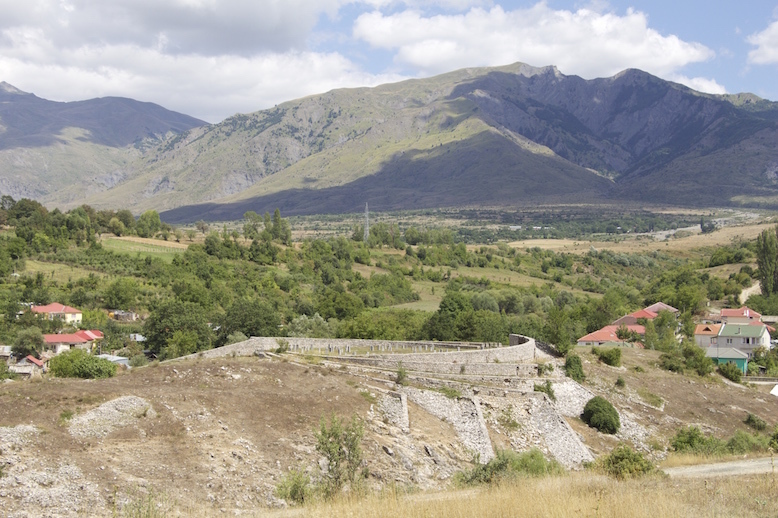 We would strongly recommend this city and accomodation to everybody visiting the South of Albania! The beautiful mountains in the background - evening mood. 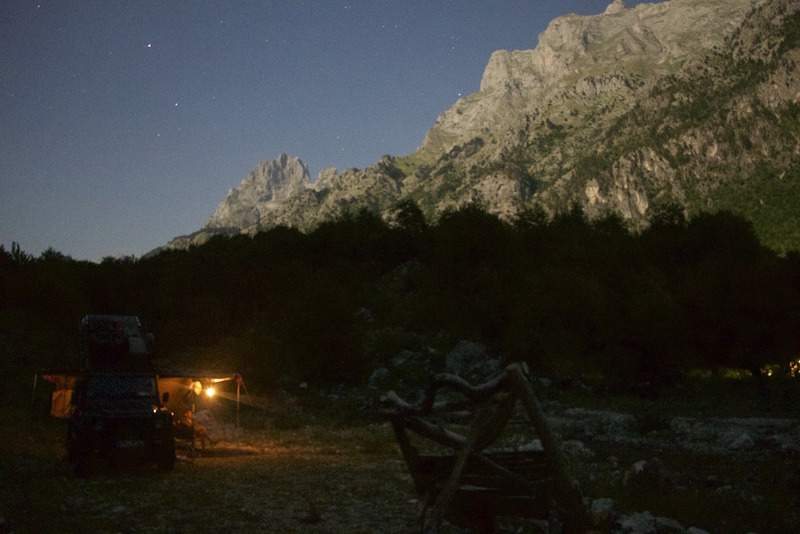 This entry was posted in Africa Overland and tagged Albania on 23. August 2015 by Juliane und Mischa. The previous night we had spent next to an ancient bridge ... only the next morning a passer-by informed us that this site is "famous" for dangerous falling rocks from the nearby cliff. Well, we survived! We set off after a brief brekkie ... the tourist information in the next village is no real help for our "problems" ("Is there a campsite nearby?" - Sóley had thrown up and we need a laundry machine ... "Where is the bear rescue station Greek friends had told us about?"). On the contrary, it is rather difficult to find the tourist information at all as in the building bearing that sign we only find an office responsible for issuing dog tags - which takes a while for us to find out. Only after long asking around and finding our way through the authority djungle, we find somebody who is responsible for tourists - only that he doesn't know about that it seems, and also he cannot communicate with us in English or German (and we don't speak Greek, unfortunately!). ... 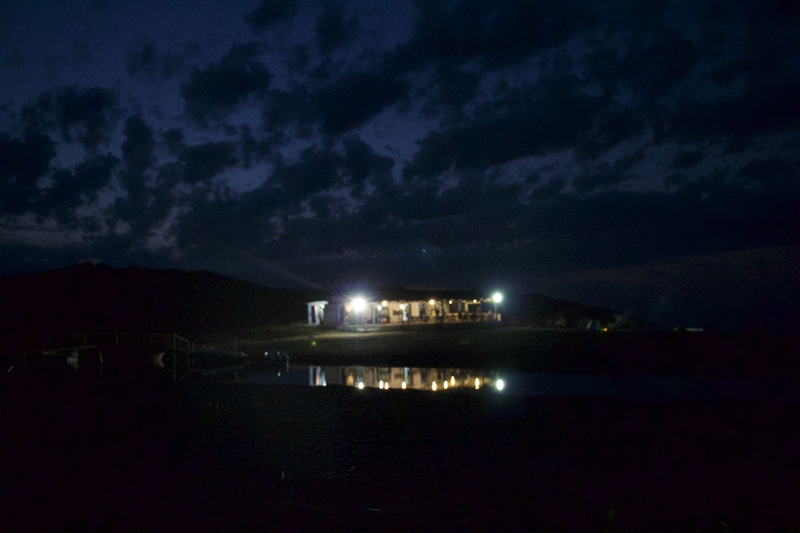 Somehow, we are still able to find out that there is neither a campsite nor a bear rescue station anywhere nearby. 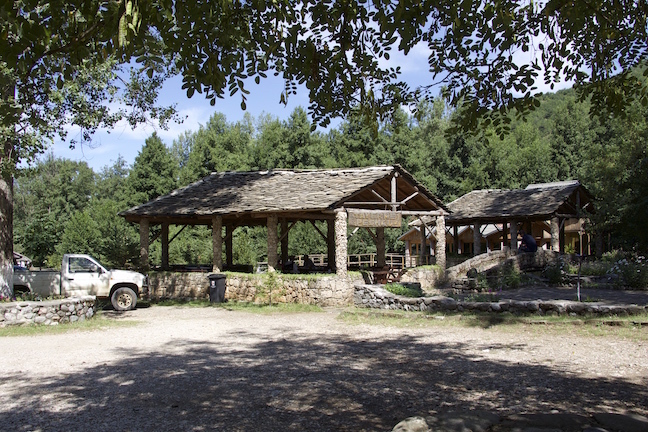 The Greek government had apparently prohibited the establishment of any campsites due to the increasing number of bear attacks. Only a story? A fairytale? However, we go on to find out where the roads will take us today! On the way to the next city we find no signs for campsites and also in the city there only seems to be room for hotel-tourists. 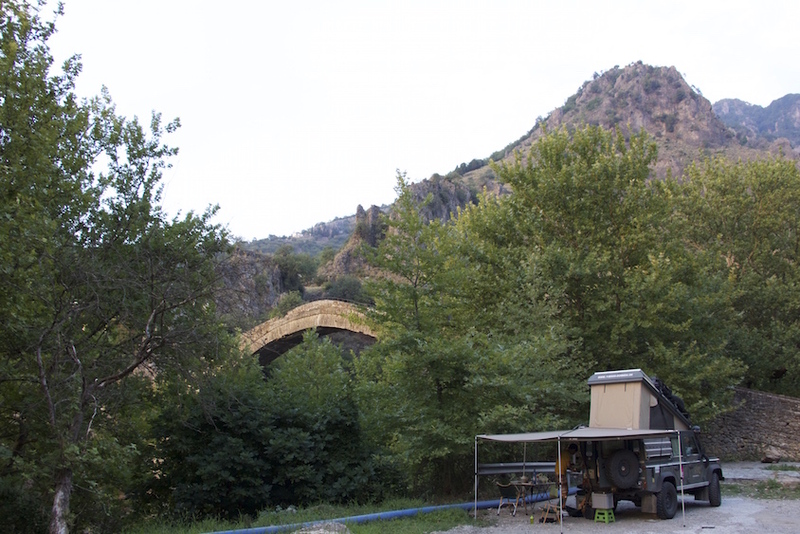 So, we cross the border to Albania knowing that there it is normal that any guesthouse, restaurant or hotel in the countryside provide free camping opportunities in their backyard or parking lot if you stay at their restaurant for dinner and breakfast (the food is about the same price of a Greek campsite). At the border we immediately sense the difference between Greek and Albanian border police: while the Greek police are nearly Germanic-correct, polite but a bit reserved, we again experience their Albanian counterparts as being extremely relaxed and friendly if a bit cheeky. It's really nice to be back in this country! The road to the mountain village our guidebook recommends is in unexpectedly good condition. I hear myself saying "These roads are even better than in Greece!" ... until, well, until it was bound to happen: in the middle of some nameless village on our way, asphalt turns into gravel. Still unsuspecting we continue on our way. We ask a farmer guiding his horse drawn carriage using hands, feet and our map for the way and figure out from his reactions that we still are on the right way and will have to turn right where the roads part (!). So, on we go! ... our travel speed has been reduced by the "road" to roundabout 15 km/h and the "road" - a yellow one in the map and no 4wd-only track - turns out to be the worst agricultural road we had experienced for the last few years. We find the fork in the path which doesn't reveal its identity by roadsigns and our Land Rover ploughs on in the truest sense of the word. 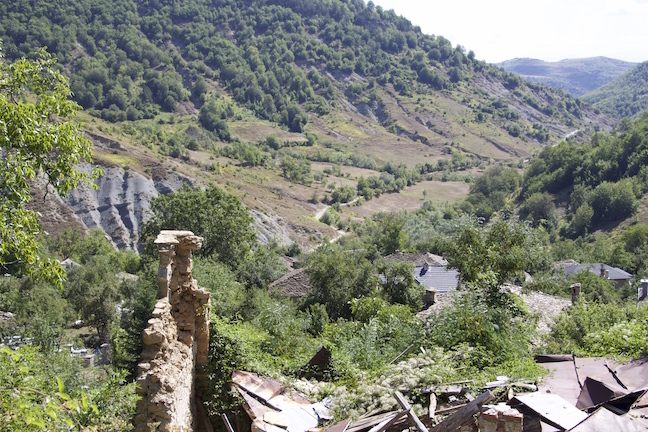 ... About 70 minutes later - we are still on this piste turning from mud to gravel to stones to rocks and back to mud - we see the first few houses of the mountain village we are looking for in the distance about 3 km away from us. 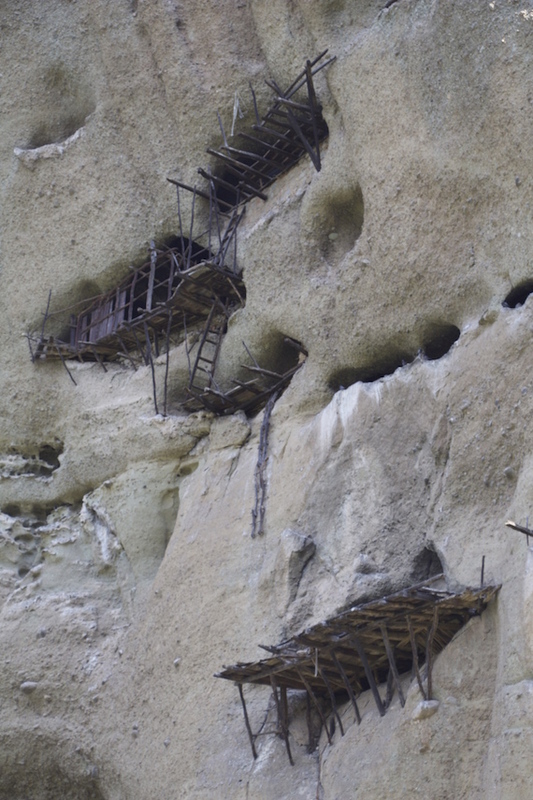 Frolickingly, we gasp with relief ... not knowing still that the ascend to the village is bettering everything we had before experienced. Apparently, we are on a bad hiking route now and nearly all propulsion is done in first gear with a lot of support from the handbrake. Due to that, we finally change gears to cross-country reduction and activate the diff lock (courageously, I had abstained from that before) ... More than once we nearly topple but still courageously plough on. Really strange is that both kids, who don't like asphalt serpentines and have to throw up every now and then, are rather swinging-cheery and bawl kindergarten songs! 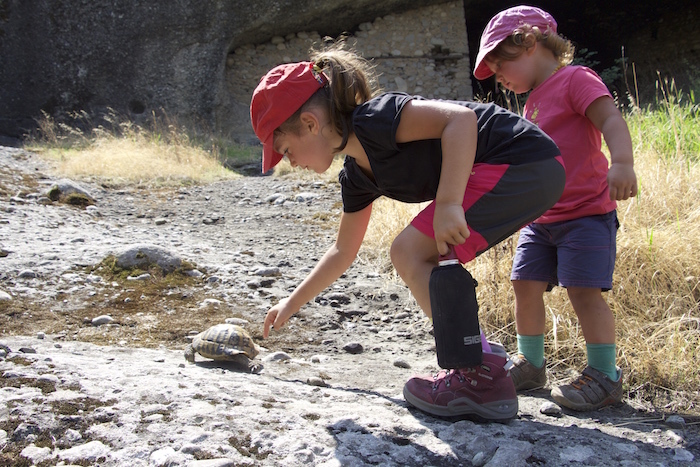 Offroad-travel-children! 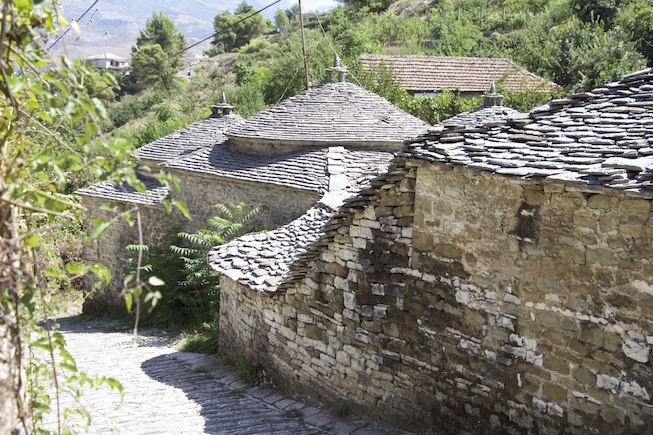 Finally, we are there - only to discover that from the other direction a proper road connects this village with civilization, because this village is supposed to be the most important winter sports village of Albania. In the background you see the track - looks quite romantic from this perspective! Exhausted and still a bit confused because of the shaky dirt track, we ask the first people we meet on the road where we could stay for the night and which restaurant is good ... We get no directions but Juliane is guided by the man and I follow through the slopy village, in turns I stick to walls (just in case I topple - so I still have at least something to hold on to) until we finally end up at a half level lilliput parking lot where we are supposed to park and setup camp. The pub is only 15 m away. There we get an immense dinner which we are not able to finish for only about 23 € (local sausage, a giant portion of snails which regarding taste are not being camouflaged with the help of sauce or cheese-gratination, fava beans, a mountain of french fries, the local Tzaziki, bread, a giant salad, two ice cream, two mulberry-Raki, one coffee, a tea, a beer, a red wine, four lemonades!). The locals slap us on our shoulders that we managed to come here using the bad road (nobody else takes any more ... "strong car!"). 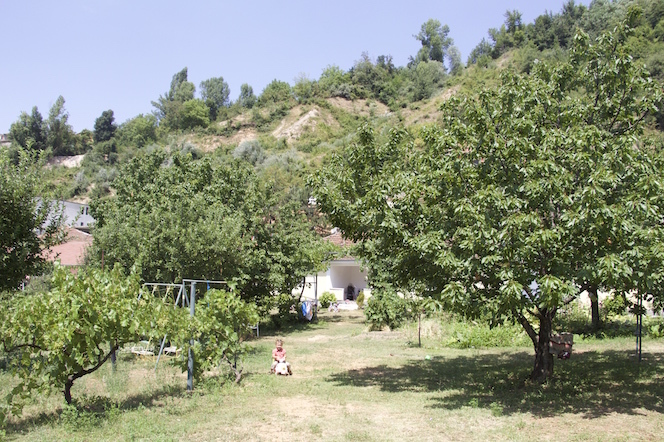 Later that evening, the children are sleeping in the car, we sit together with a professor for Albanian language, who is a local and has also taught in Germany. At the table next to us, a famous TV-host (of the Albanian version of X-Factor), the son of one of the most important recent Albanian writers, who is also here, plays the guitar for a large round of villagers who join in into his singing. 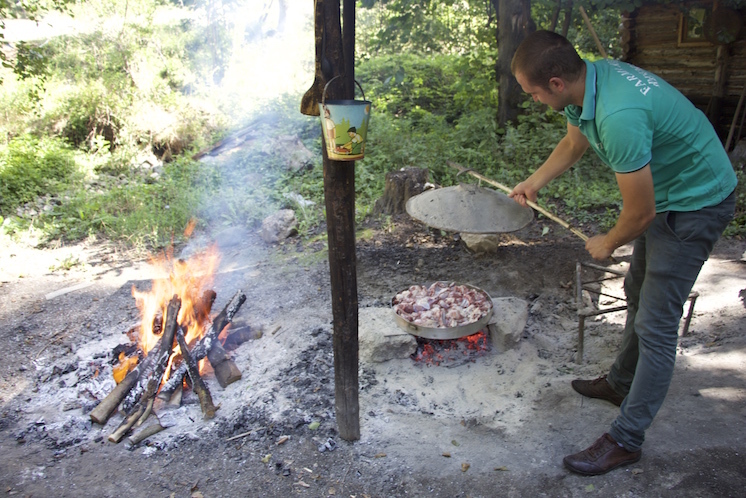 Believe it or not, but this is just a normal day on the road in Albania ... it fades away with the chants from the pub which resound into the deep night (cold it was, too!). In the morning, we are allowed to use the showers and toilet of one of the holiday flats - for free because the guy that brought us here is a friend of the landlord. This would have been the perfect wild camping spot ... but, alas, the thunderstorm chased us away! From our new friends' beach house in Agkali (Greece) we went on back to Kalivia Varikou still being unsure on whereabout to head next. 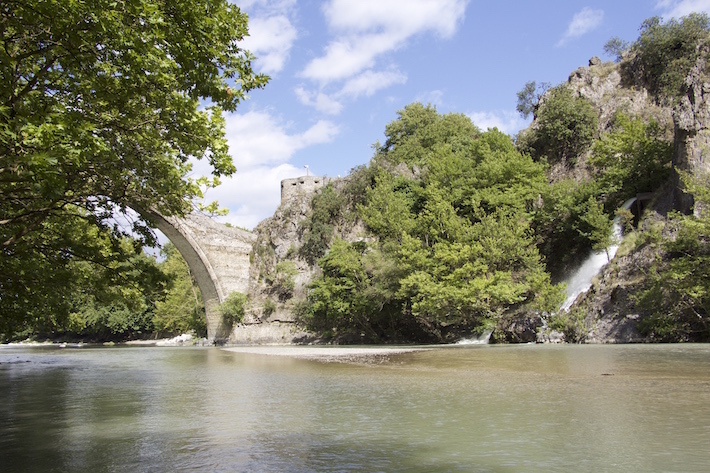 Turkey and especially Istanbul was one idea, but also we wanted have enough time to go back to Albania to later discover the Greek west coast and the Peleponnes penninsula. The "Turkey solution" would have meant an insight into another different culture and the "Albania/Greece solution" would allow us to travel slowly and delve deeper into the culture. It was a hard decision but as so many interesting countries, cities and cultures lie on our way down to Cape Town, we opted for the slow travel version. 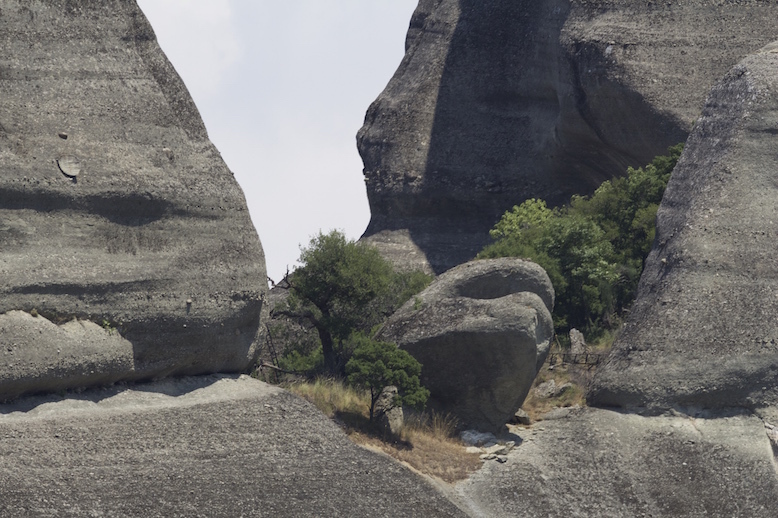 Turkey still is "on the list" and we will go there as soon as possible - then including Georgia, Armenia, Azerbaidjan, Iran and whatever country we also have time to visit! 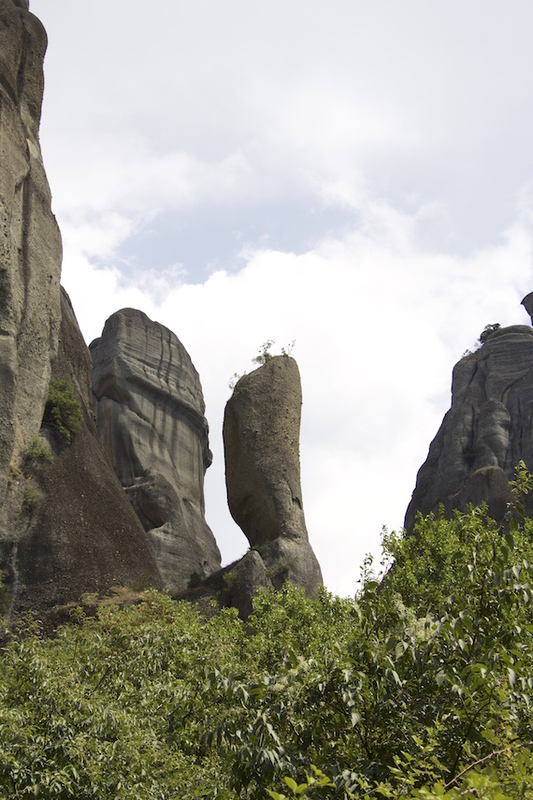 From Varikou we headed for Meteora, which simply was impressive (see our post on Meteora), especially because we discovered it from its less touristy side walking through beautiful nature. 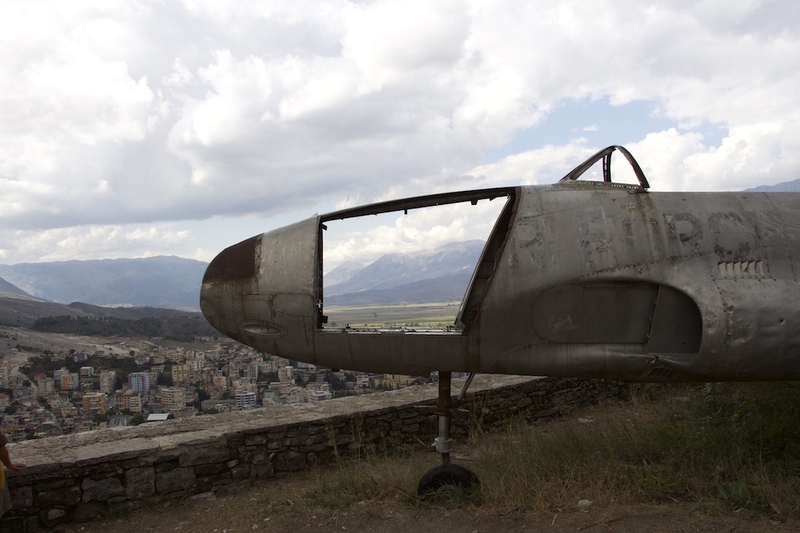 Old and new in Korcë, Albania. 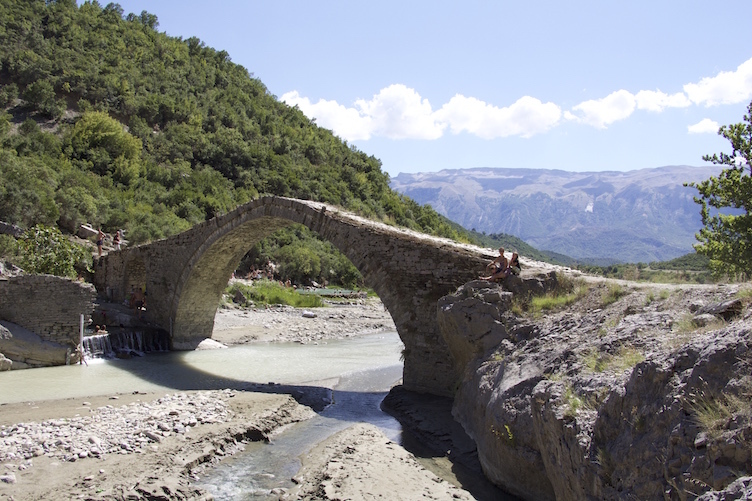 After that we went further north and spent a night at the beautiful bridge of Konitsa, a World Heritage Site. 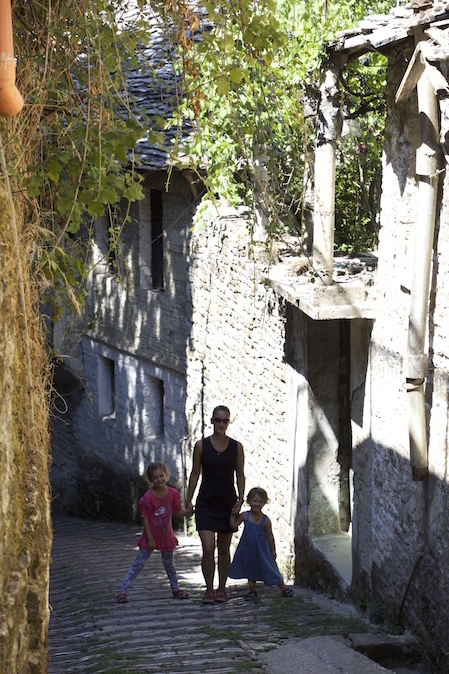 From there, we went on back to Albania to discover the beautiful village of Dardhë, continuing to Germenj. 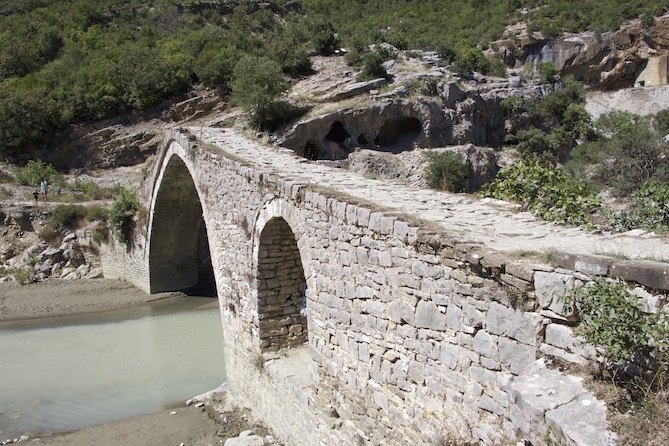 From there, we drove on to Gjirokastër. Both the vegetation/countryside and the road conditions on the way reminded me on Norway or Sweden about 35 years ago. One thing that annoyed us, though, was the fact that almost everybody seems to be throwing their waste into the nature wherever they want to. This is really sad, as especially the countryside and nature of this wonderful country is so very special and precious and will most certainly attract tourists from all over the world which would give this poor country a chance to make its way into a more prosperous future. Restaurant, farm ... and we can camp here. In the communist times this was a holiday camp. ... that's what freshly cooked means! 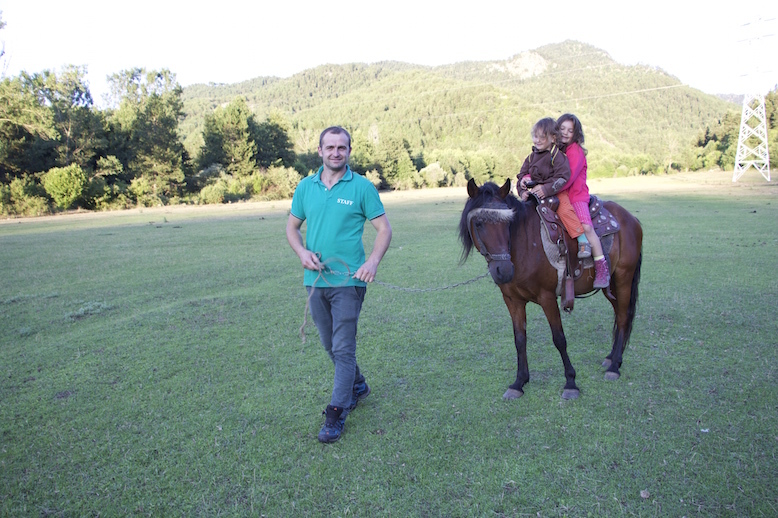 The girls simply love horseback riding! Another bridge ... we planned to wild camp here, but it's a bit too touristy! 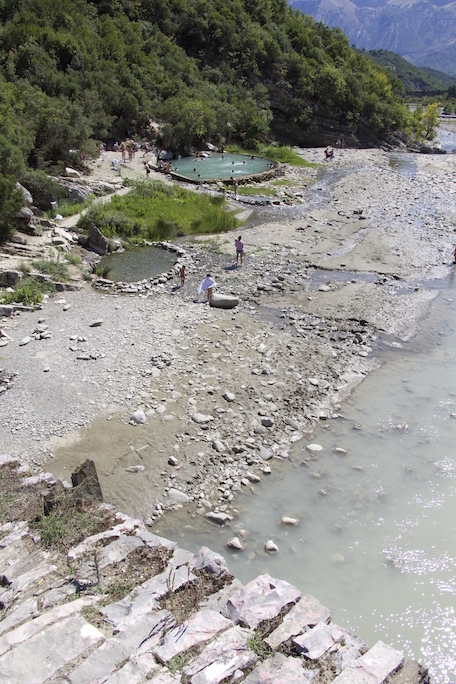 Spa for free ... it smells a bit sulphuric, though! 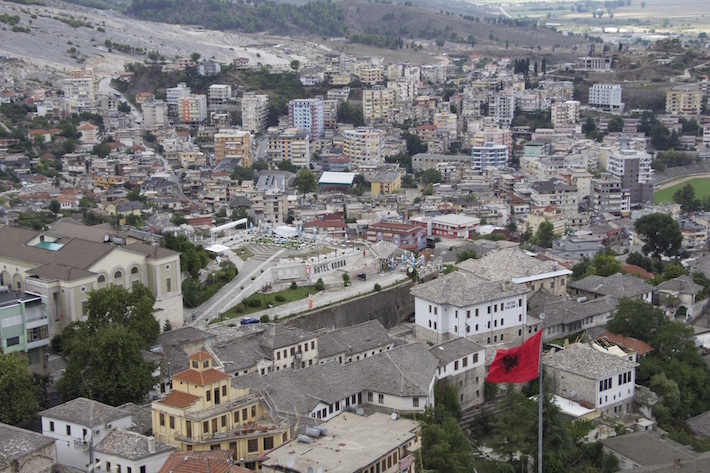 Anyway, we are in Gjirokastër now, and enjoying hostel (Babameto Hostel) and city life ... just as the Albanian president who is visiting this city just at this weekend. 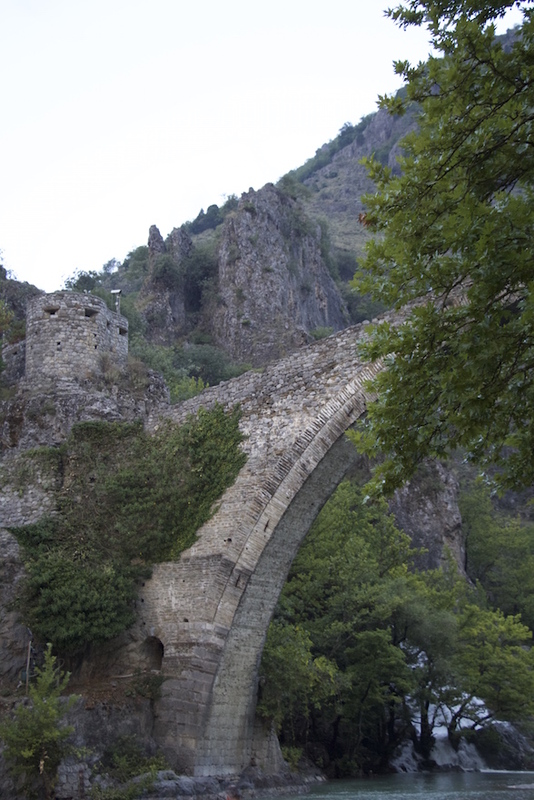 This entry was posted in Africa Overland and tagged Albania, Greece on 22. August 2015 by Juliane und Mischa. 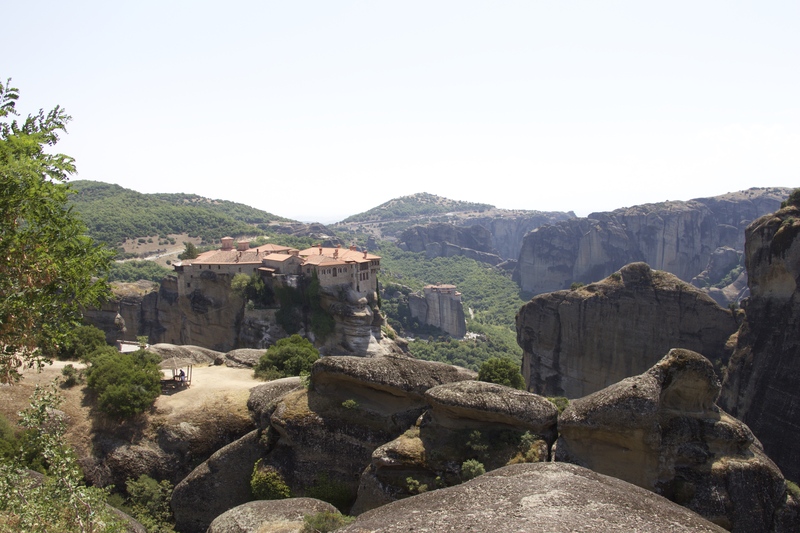 Actually, we don't quite like too touristy sights, but we thought that we could not go to Greece and leave out Meteora. 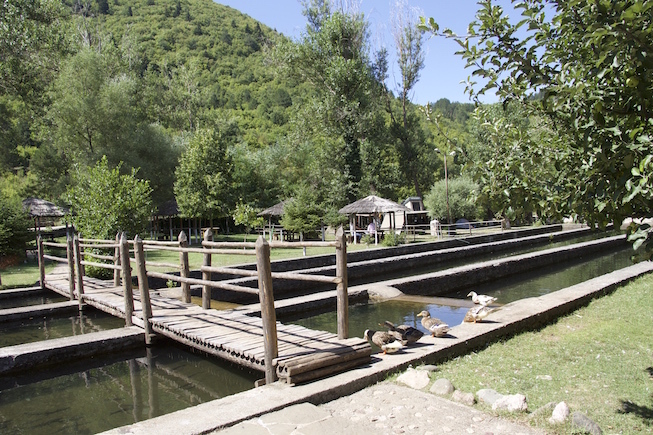 To be honest: we are totally impressed and this place surely is worth visiting even though it is touristy. 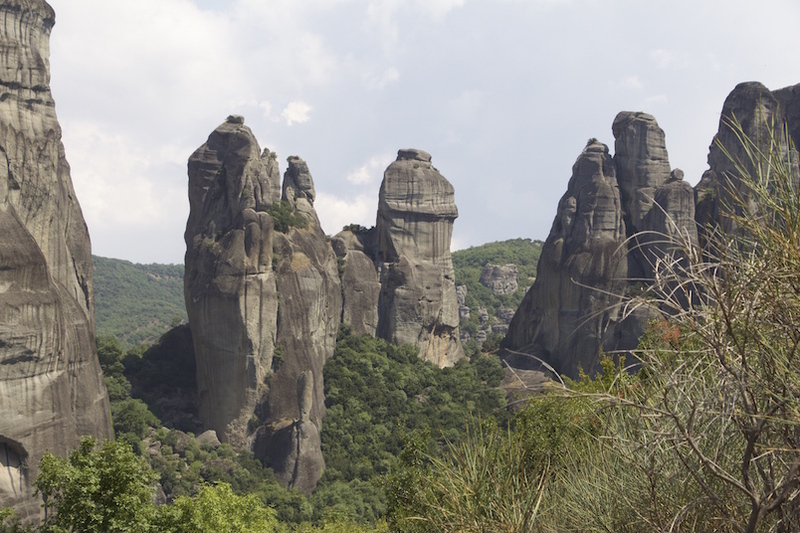 Just like Kata Tjuta (the "Olgas") in Australia, these sandstone rocks suddenly appear to the approaching traveler that it is quite obvious that generations of humans have interpreted this place as somewhat out of earth. 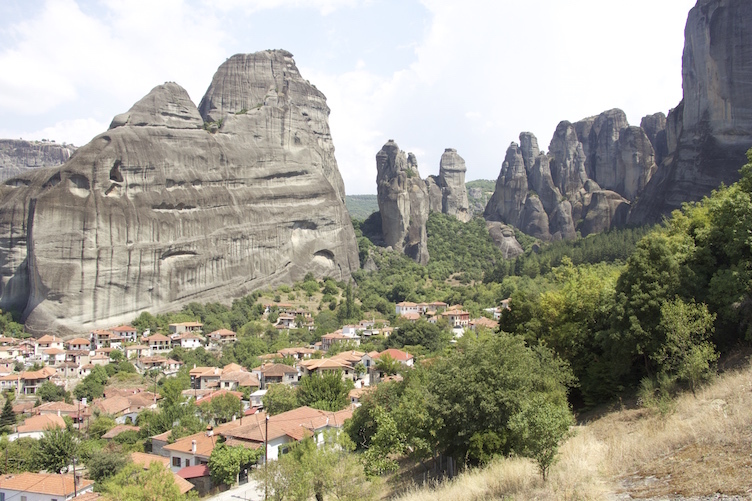 The very name "Meteora" which reads "middle of the sky" supports this. 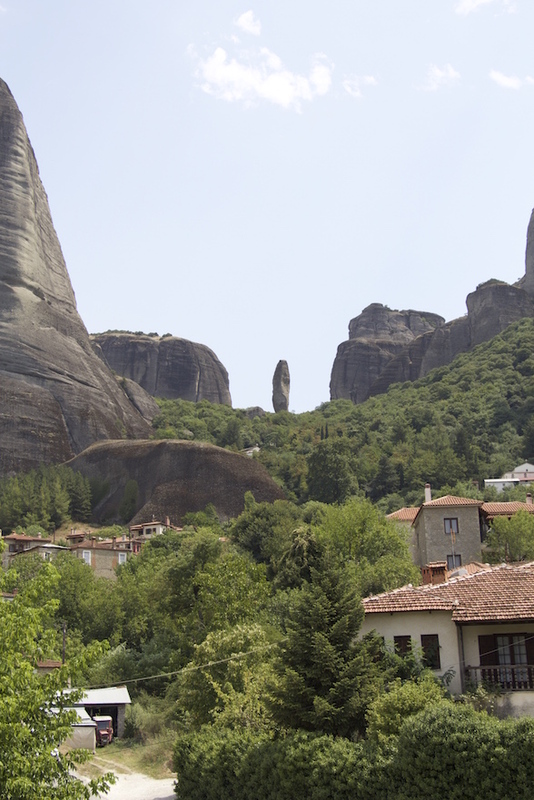 Meteora is a very important site for the Greek Orthodox church and I am sure that the monks who started building the monasteries glued to the rock walls before the 11th century were not the first here to worship nature and creation (actually, a cave nearby has been inhabited for the last 50.000 years!). 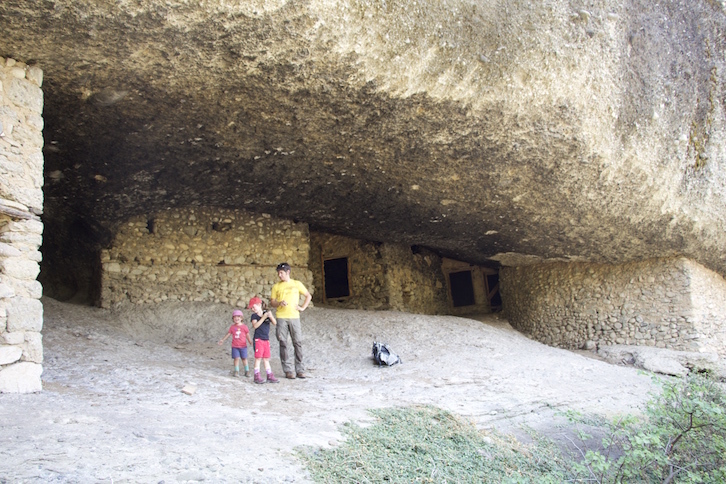 We went for a four hours walk with the kids and took paths less traveled by omitting the major tourist sights. 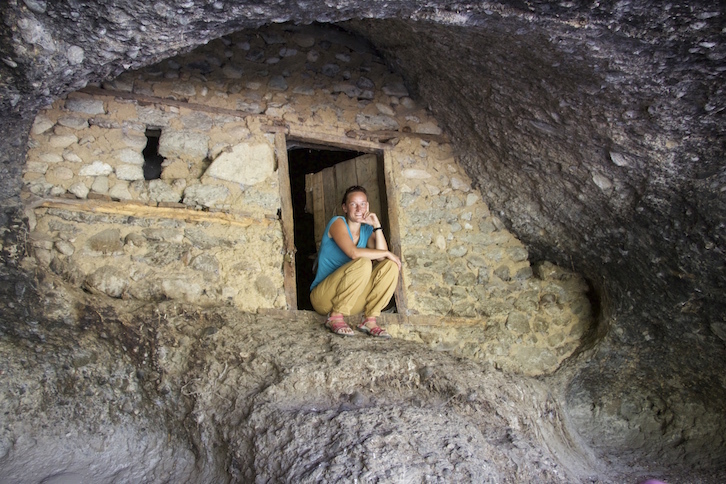 In many ways, we feel remembered to Ethiopia and its rock hewn churches and mountain villages situated isolated on the top of the mountains. 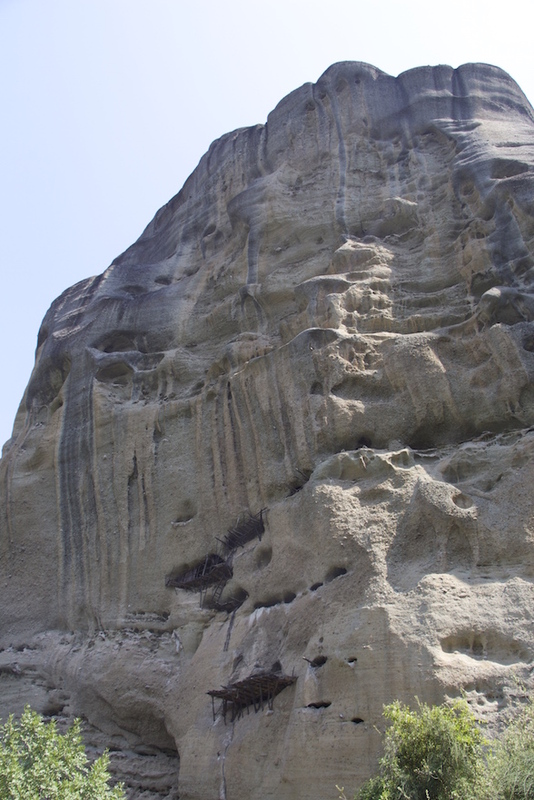 The sandstone rocks remember Juliane of her home, Saxon Switzerland. 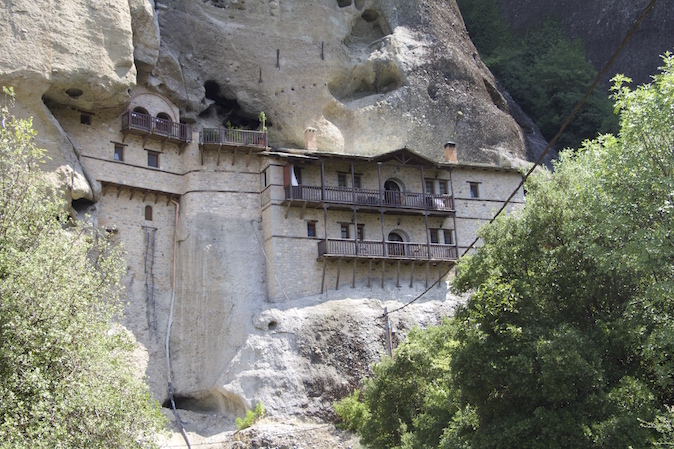 The "new" monastery, inhabited by one (!) monk! 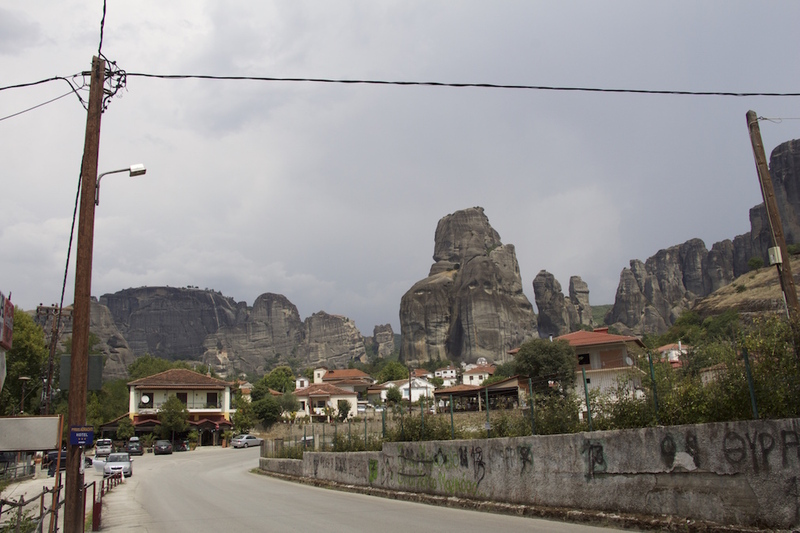 ... one day later, we found out that we only saw the remote area of Meteora ... it does, however, have another side with hundreds of tourists and large coaches parking at the roadsides. 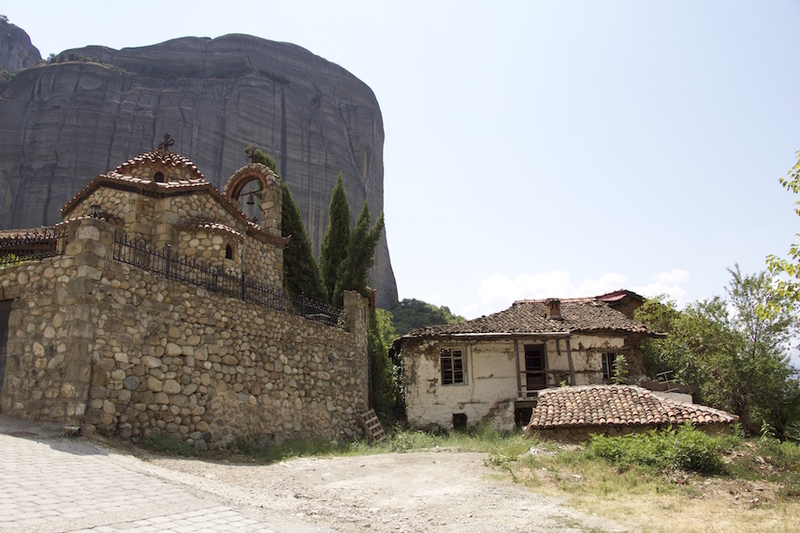 Our suggestion: go for a walk through the mountains around Meteora and just pick one or two touristy monasteries - then the spirit of Meteora will not be destroyed by the masses! 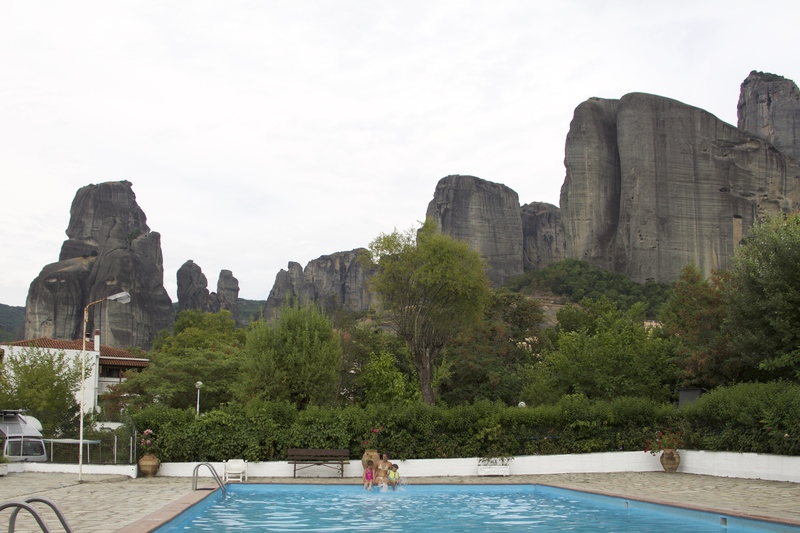 A pool with a view! 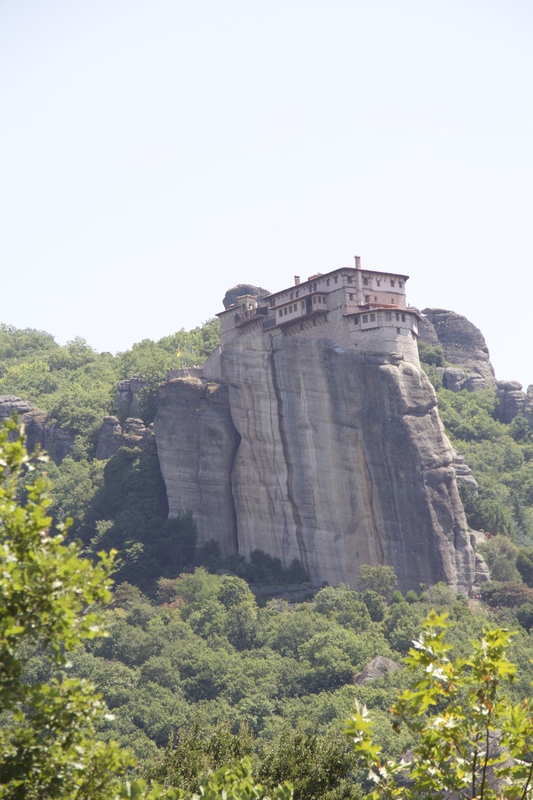 This entry was posted in Africa Overland and tagged Greece on 14. August 2015 by Juliane und Mischa. 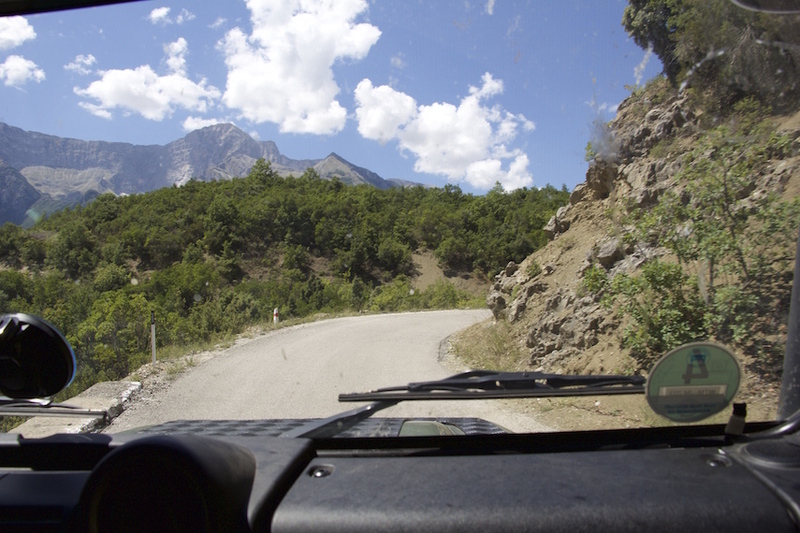 Overlanding includes unfamiliar aspects any overland-traveler has to adapt to I suppose. One, and maybe the most important one indeed is "accepting somebody's help "! Due to whatever cause, we are used to help always having to be reciprocal ... And also, when people approach us with a help offer, we expect some negative intention to be behind that. When traveling but also even during the preparation phase one realizes that this can be totally different. In this context, the positive side of Facebook and blogging becomes clear as well: during the last months quite a few overlanders. 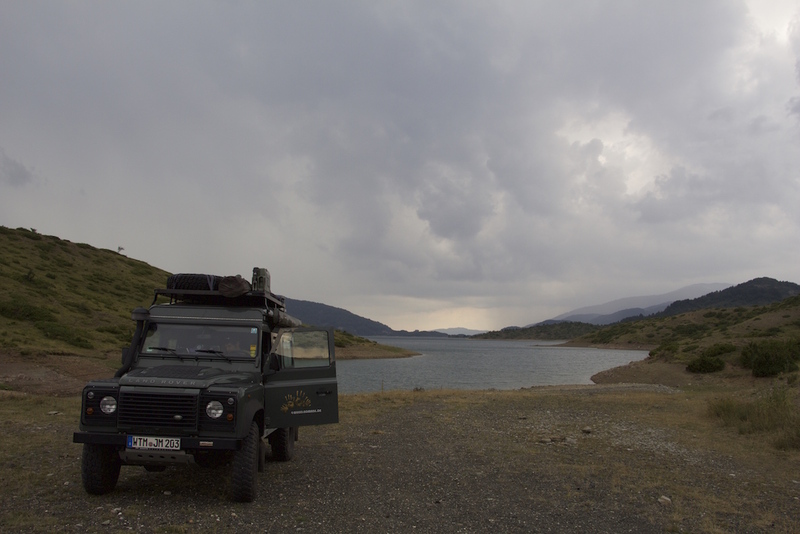 Land Rover owners and others who were simply interested in us and our planned trip contacted us via the internet providing insider tipps for Transafrica or even invite us to their homes which would lie along the planned route. Several nice people did, for example, work from their homes in Cairo on finding out how we could ship our Land Rover to Africa or what other possibilities do exist reaching Africa overland at the moment. Now in Greece, while traveling, our first travel-"blind date" waited for us. 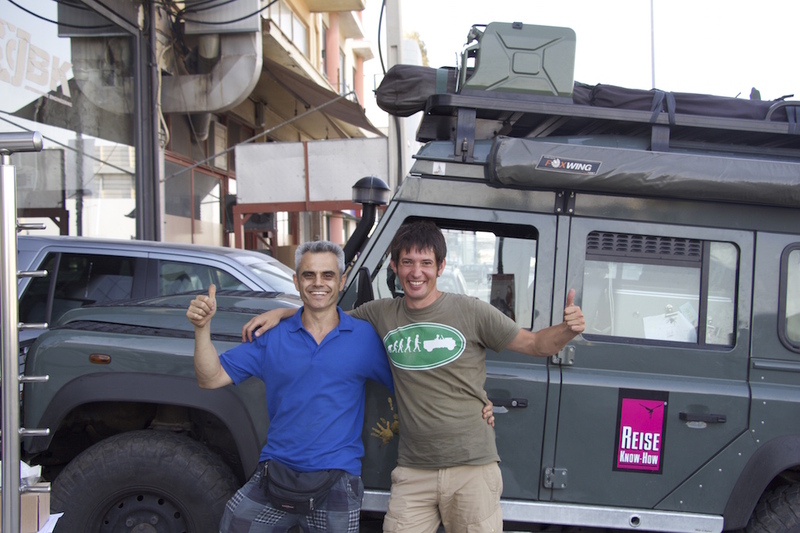 Sometime at the end of June, Konstantinos (also a Land Rover owner planning a long overland trip with his family) had found our blog and - apart from giving interesting tips on where to go in Greece - without heasitation invited us to his home in Athens. After we had discovered strange sounds coming from the engine in Albania (sounding a bit like a tortured chicken) and neither other overlanders nor a proper Albanian bush mechanic could help us, we decided to accept Konstantinos' invitation earlier than we had actually planned and directly go to Athens from southern Albania to have the Land Rover checked at JBK Land Rover Specialists, THE Landrover-smithy in Greece (an absolute workshop recommendation, by the way, for any Land Rover Owner passing Athens ... they are "Land Rover Horsewhisperers"!). We reach Athens in the early afternoon only to realize that everything (and I really mean everything) had been organised in advance: we reach Konstantinos' house, who is just waiting for us to go to the workshop together while Juliane and his wife Errato are taking care of our four children. JBK - The Greek Land Rover "Horsewhisperers"
In the workshop the "chicken"-problem (not electric, but mechanical by the way!) is quickly identified and solved, so that in the evening we can feast on Greek "Souflaki" getting to know each other while the Land Rover is relaxing outside the house in the shade. During the next few days we chill out together at the beach house of the family enjoying famous Greek hospitality. 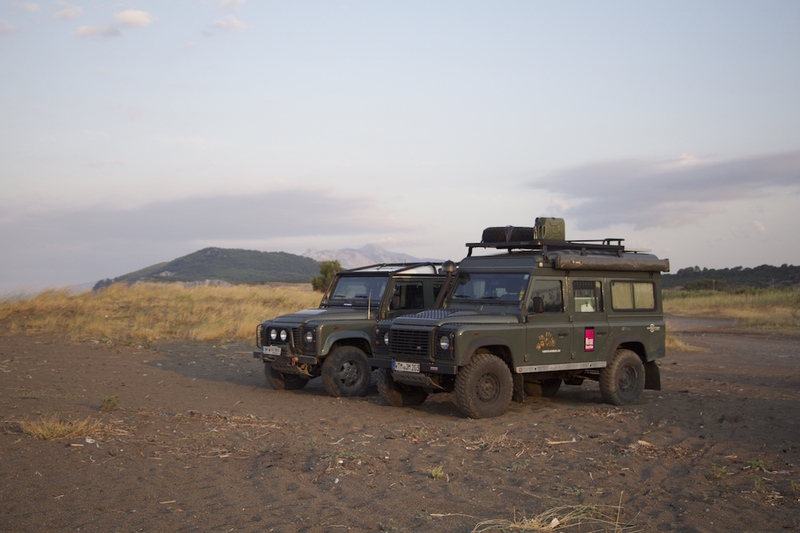 Apart from the common interest in overland travel, here the international comradeship of Land Rover owners is part of the story! Land Rover owners not only wave at, but also help each other! Do people actually consider this when choosing their overland-vehicle from a different car brand? 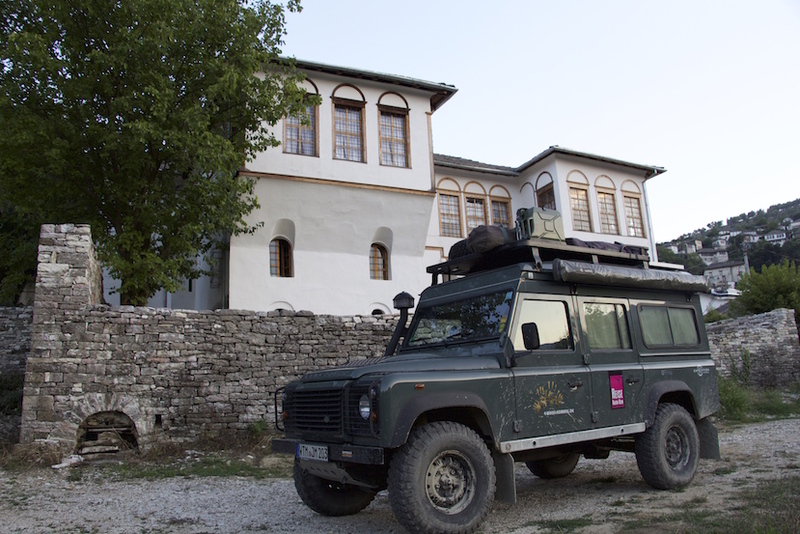 The Land Rover team spirit is a door opener for other cultures and nearly some kind of "secret insurance"! 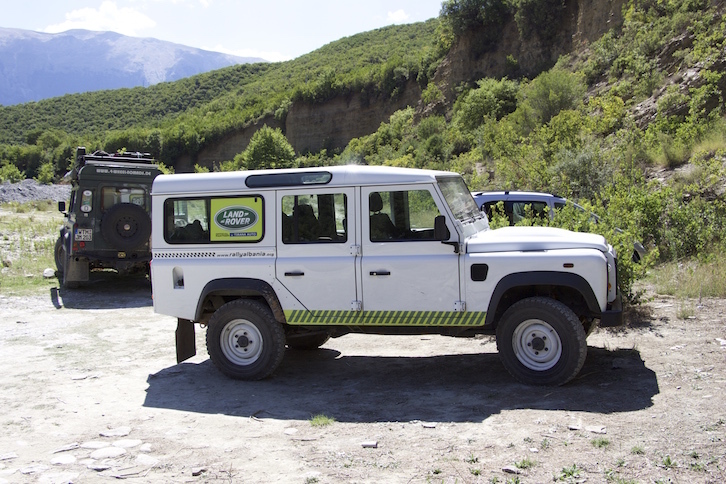 ... the car mechanic in Albania senses our scouring eyes, approaches, asks ... just to leave his own work for a while to lead us to the bush mechanic recommended by our campsite owner (who actually is a competitor) riding along with us on our side stepps. ... We could go on telling a bunch of other stories here even though we have only been traveling for four weeks now! Of course, at home in Germany, there are also warm hearted and helpful people, but this intensive openness and warm-heartedness we experience here we are not accustomed to. 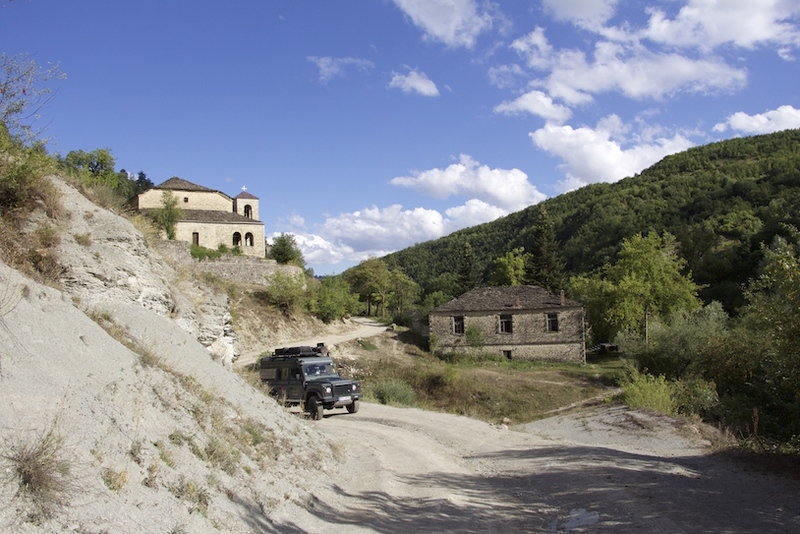 From beautiful, nearly enchanted Valbone in Albania, we go on our way down south planning to find a place to camp between Kukes and Peshkopi. A few kilometres before reaching Kukes both kids throw up just like searching fire and create a big mess on the rear bench seats so that we have to stop to clean up the car (on a hilltop while a thunderstorm is approaching) ... now, even more pressure is on us finding a good campsite. Unexpectedly, this task turns out to be quite a difficult one. Finally, while entering the city of Peshkopi, we discover a handmade sign reading "Camping", scouringly wind ourselves through the chaotic lanes of this rather oriental seeming city, repeatedly think that we have lost our way, but finally reach the small and simple but very neat campsite in the orchard of a detached house which is not in any guidebook, I suppose (for more see our Accommodation Page). As described, the landlady cooks for us and we enjoy the company of friendly and interested people. After the Muezzin calls the believers to prayer, this wonderful evening fades away with the nearly Arabic seeming sounds of a wedding in the near neighborhood. 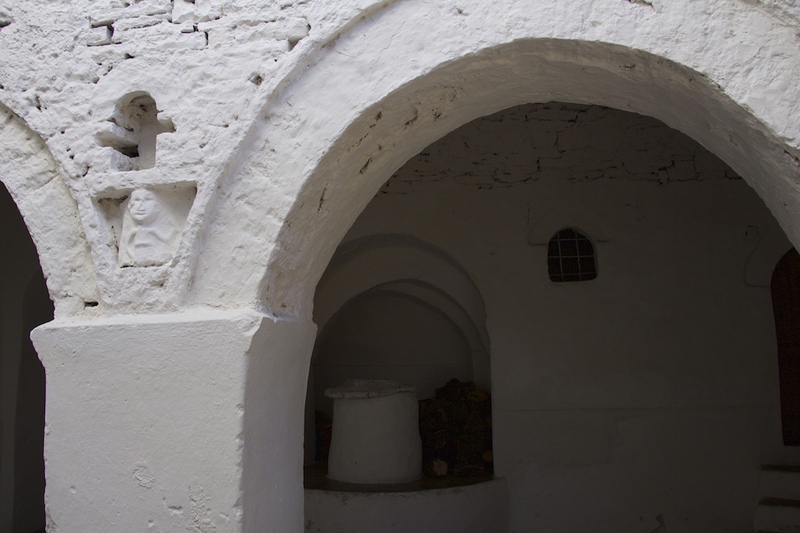 Shortly after having left central Europe, we feel like being inside "The Arabian Nights". In spite of the great hospitality and of being the only guests on the campsite, we are on the road again the following day. The famous lake "Ohrid", one of the world's oldest lakes, tempts ... especially our beach-hungry kids. 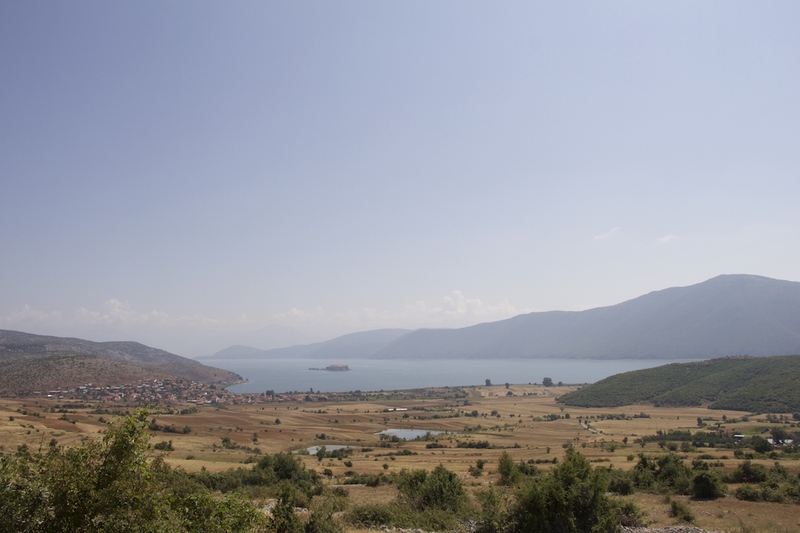 Unfortunately, this lake on the Albanian side turns out to be widely and chaotically built up and on the Macedonian side the few beaches are overcrowded with other tourists. What we don't know at that moment is - we are actually traveling without a guidebook here in Macedonia - that during this weekend it is the national holiday where everybody celebrates the "10-Day-Revolution". The result: we stand for one hour (!) in a traffic jam waiting to be able to enter the campsite and "enjoy" millions of drunken youths listening to loudest disco music who are celebrating their revolutionary fathers and mothers. The campsite is so very full that we have to set up our camp on the parking lot - and still pay 15 € for that ... Well, obviously, we don't want to stay here another day! Our family pow-wow which we summon decides that we are all ready for a proper beach and the children accept that this means driving for the complete day. This is also good, as we do really want to have the strange sounds coming from the engine checked so that no further damage is caused. 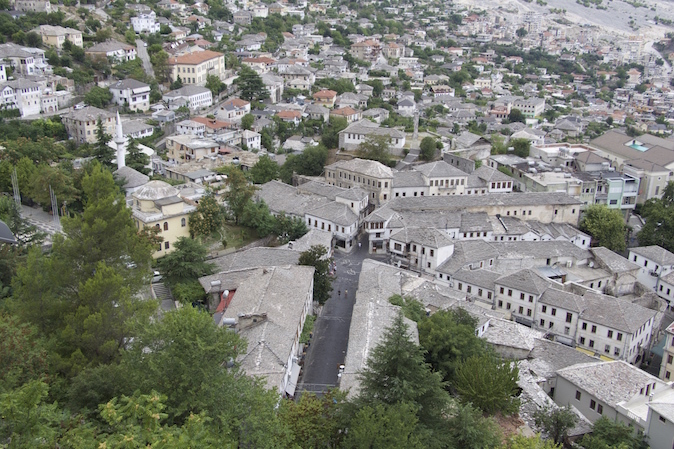 From Macedonia, we drive to south-eastern Albania and then on to Greece. 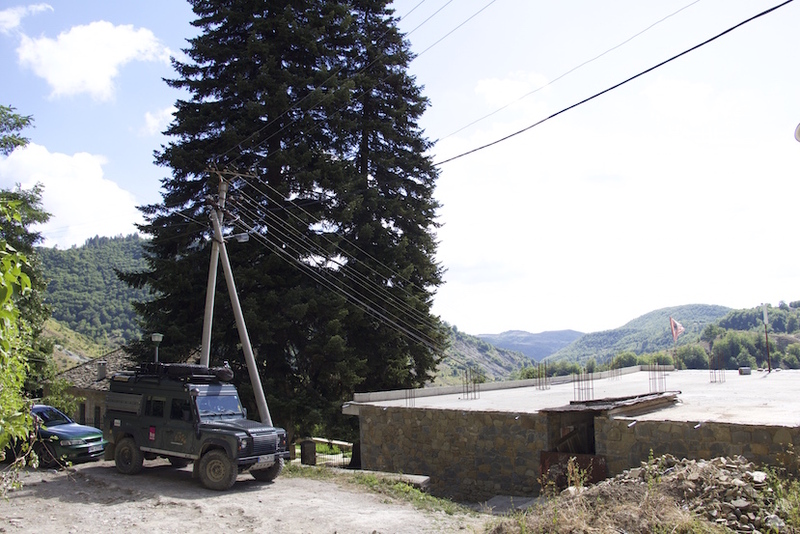 On our way, Albanian and Macedonian soldiers frantically wave at us from their Land Rovers ... "Landymania" seems to be including people who have to drive a Land Rover jobwise. I am sure other car manufacturers would give a lot for this identification with the brand and this loyalty. 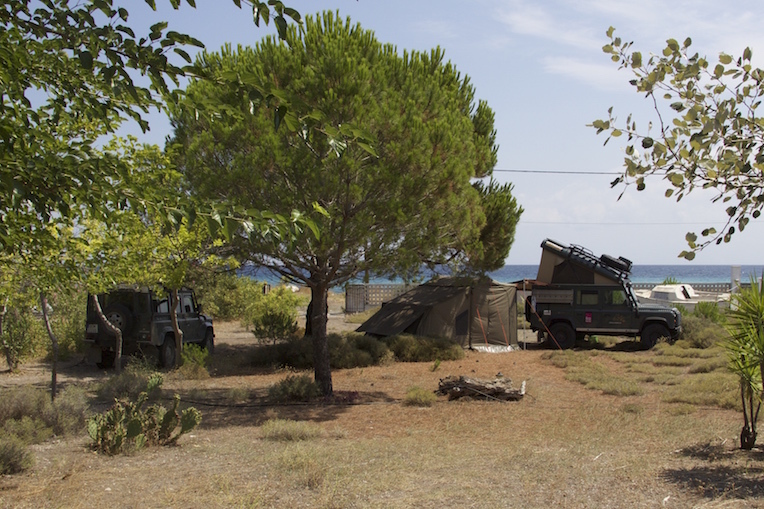 We finally land at a very clean and relaxed campsite directly at the sea in Varikou south of Thessaloniki. 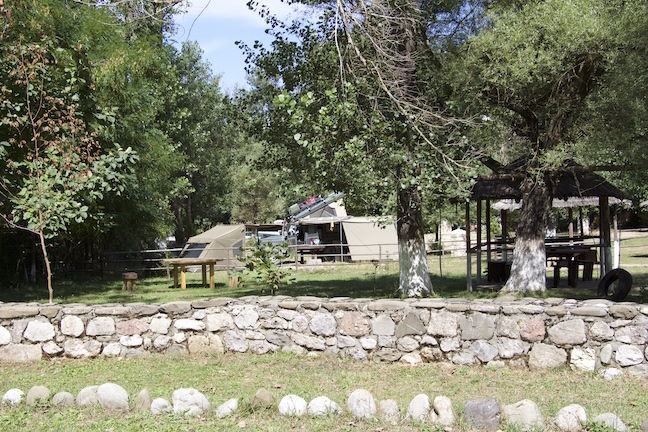 This campsite is to a large extent populated by many permanent campers but they are extremely warm-hearted and our family soon is included into the community here by big Greek hearts. Even though the engine still sounds weird, we stay a bit longer. We do have time! 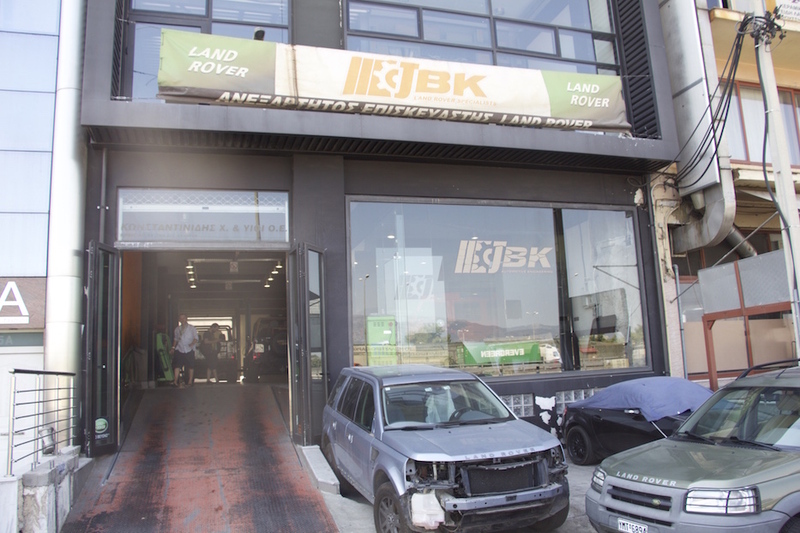 But sometime we do have to go on traveling because our Land Rover friend Konstantinos has arranged a date for us at Greece's best and most famous Land Rover workshop, JBK. 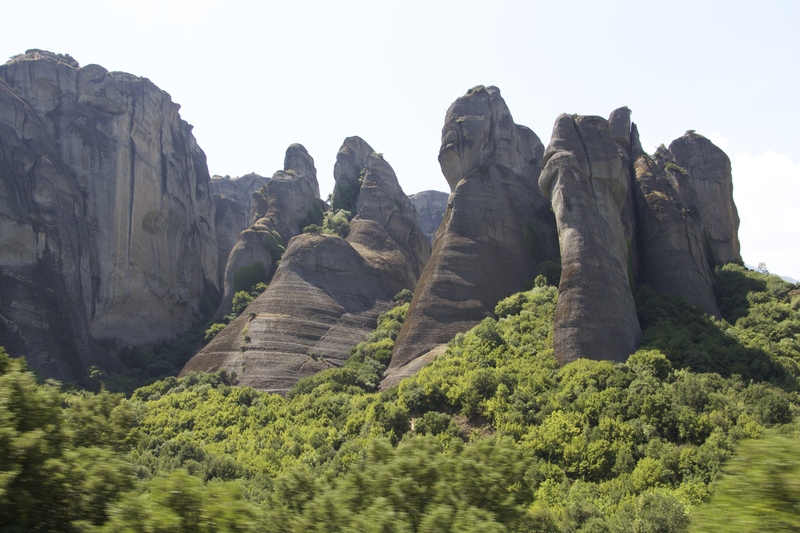 After the day at the workshop, we have to decide to either visit Athens and the Akropolis or spend some days at the beach house of the family. This is no easy decision, but actually, we are not really ready to share a big city with innumerable tourists in the summer heat and thus, we decide to go for the beach house. Athens, in addition to Dubrovnik, is put down on our imaginary list of cities we plan to visit on shorter "city trips" later on. 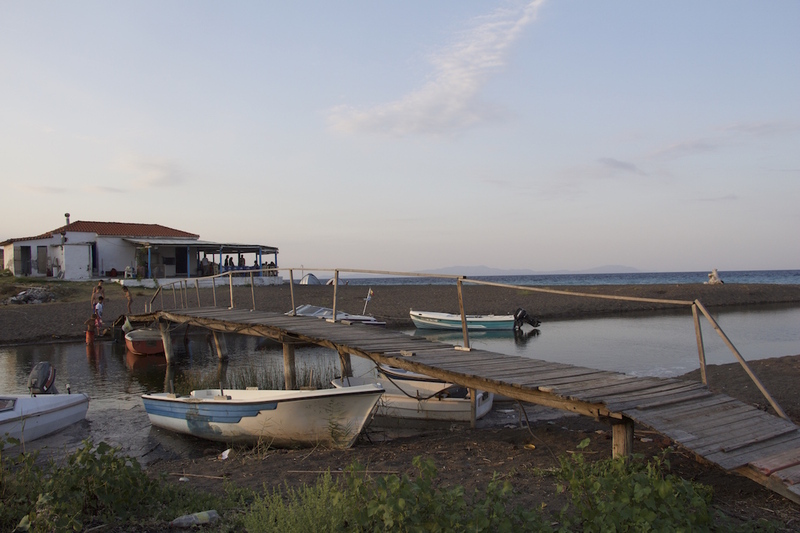 At the moment we are really enjoying the life between beach and beach house which is peppered by adventurous offroad trips into the mountain range right behind this village and culinary-trips to small beach-retaurants and local shops. 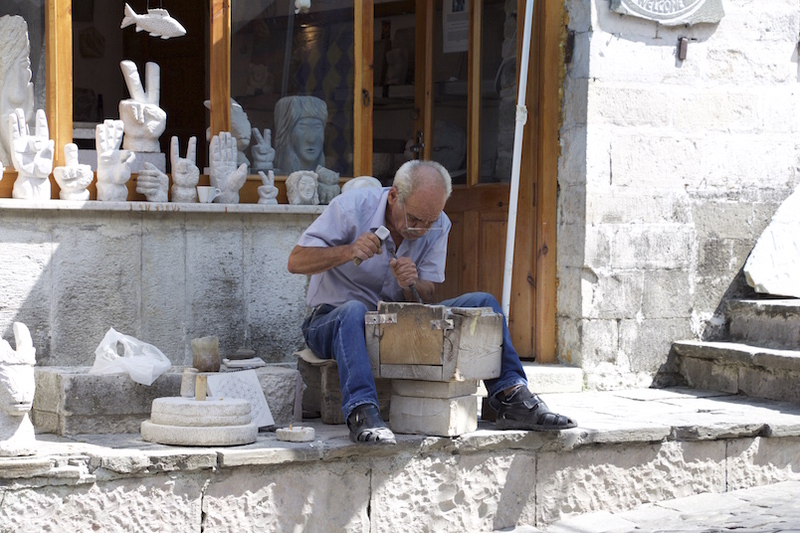 Apart from that, we sit over out map of Greece and jot down all the customized tips we get from our hosts. 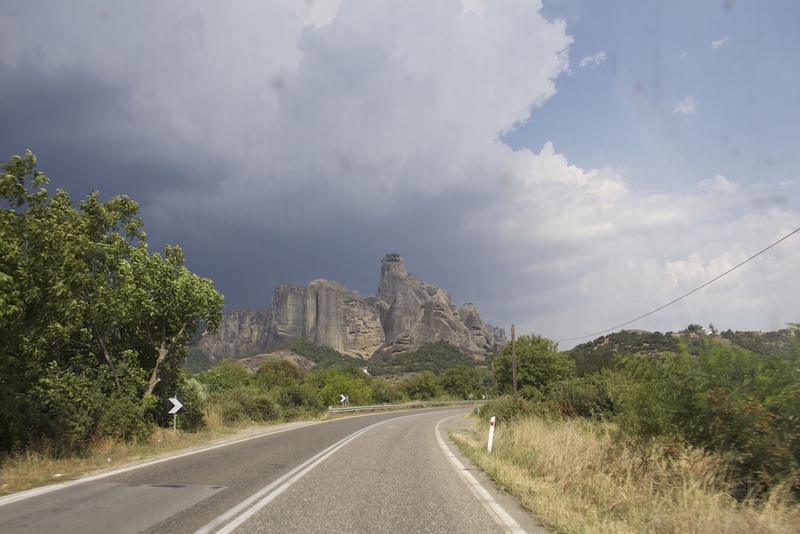 Tomorrow, we plan to be on the road again, heading for central Greece with the overall idea to go back to central South-Albania and Macedonia. 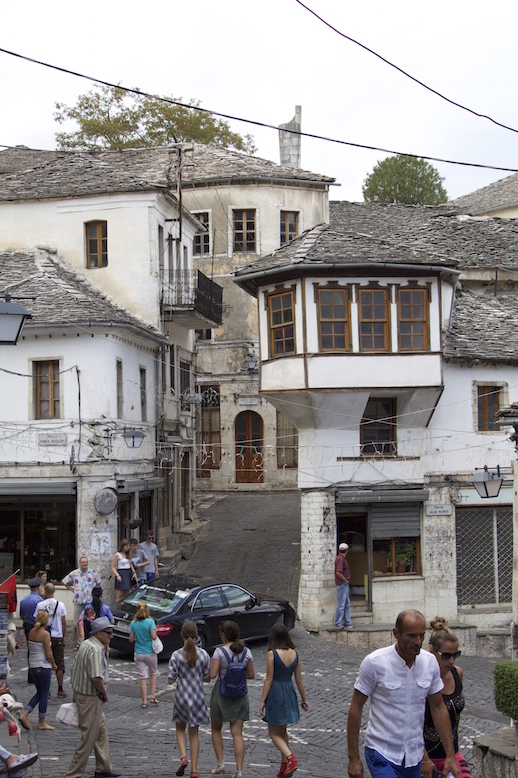 After that we might go to the Albanian south coast and then down the west coast of Greece as far down as the Peloponnes. Slow Travel definitively is exactly what we need at the moment. Both us and the kids relax, the kids play more together and seem to be enjoying the time spent together as a family but also the encounters with other people. The kids seem to realise that this is not a holiday anymore where you have to take in attention from the parents like a sponge, but that we will enjoy many months of traveling together as a family. Anouk is improving her sign language skills to be able to communicate with other children without having a common language. 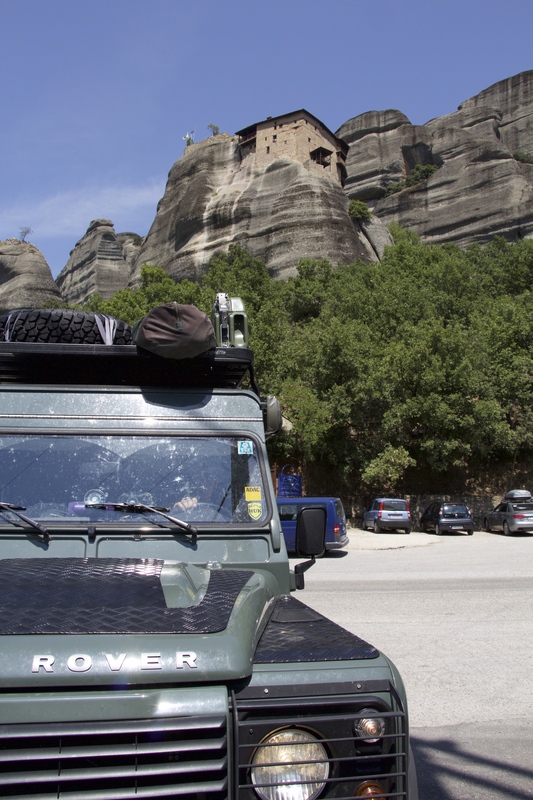 Again and again people as us why we don't ship the Land Rover to Egypt right now, but stay in "boring" Greece. Apart from the fact that Greece has many more sides which have not been destryoed by mass tourism, we also do not want to go to northern Africa right now because fellow travelers who are there right now inform us that the temperatures in Sudan are somewhere around 50°C ... in the shade ... without shade! 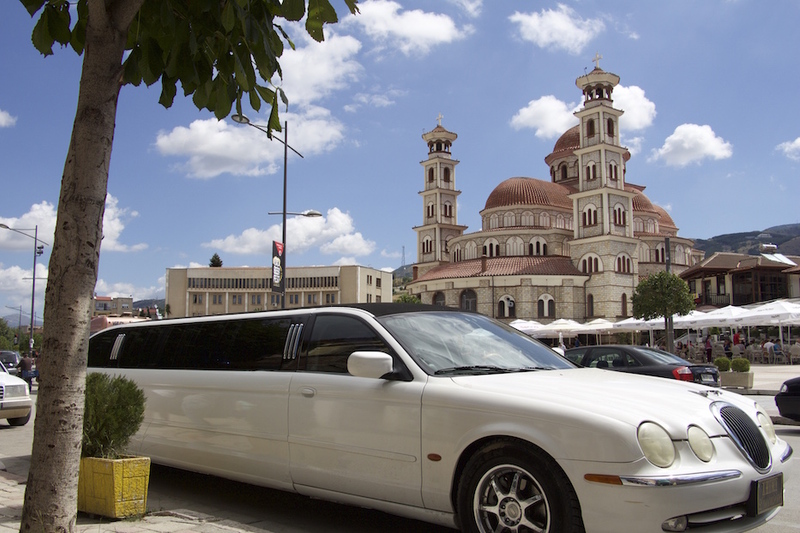 Also, we plan to team up with a British family (who also have two young kids) here in Greece at the end of September to ship our cars to Egypt together. At the moment it seems that we will be shipping from Pireus to Alexandria, but this would mean that we would have to fly because we can't be passengers on the same ship the cars will be on. There might be another possibility shipping the vehicles from Salerno in Italy where we could go along with the cars as passengers enjoying a three-day cruise through the Mediterranean. One question is troubling us a bit right now: shall we go to Turkey or do the current political circumstances and our desire to "slow travel" indicate that we have to put Turkey on the long list of countries to be visited at a later point in time. 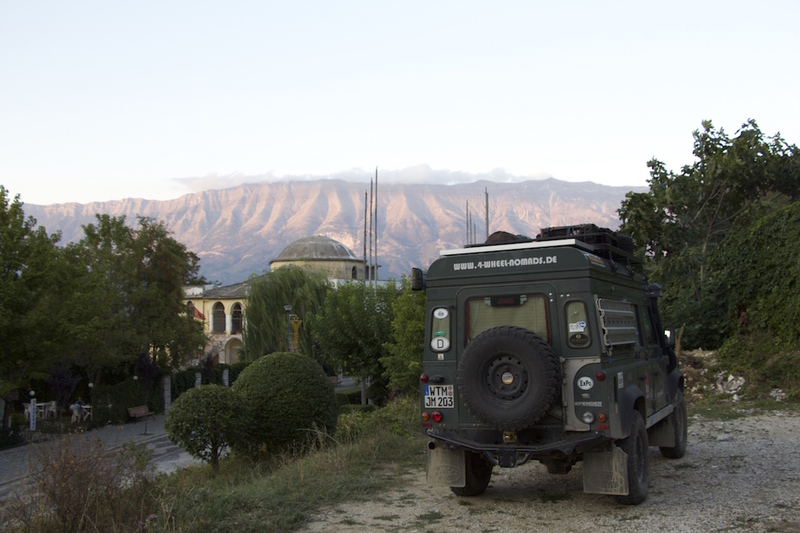 This entry was posted in Africa Overland and tagged Albania, Greece, Land Rover Friends, Macedonia on 9. August 2015 by Juliane und Mischa.